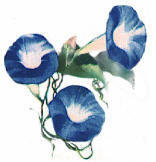 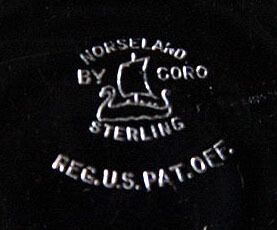 Coro, Cohen & Rosenberger began early in the 1900's in Providence, Rhode Island. 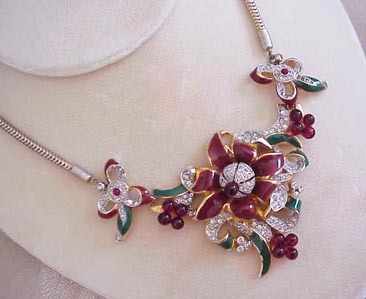 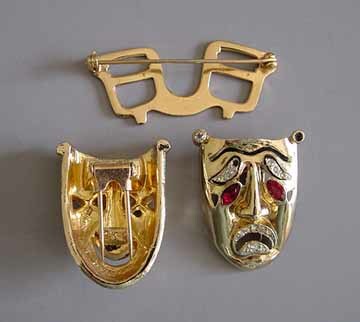 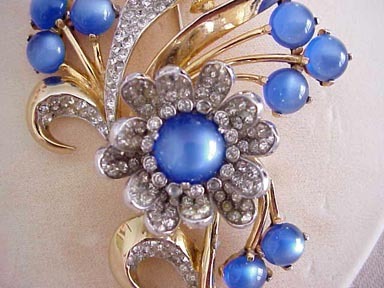 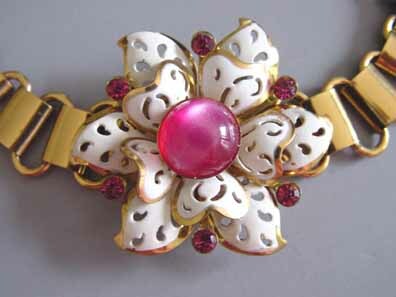 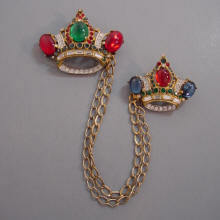 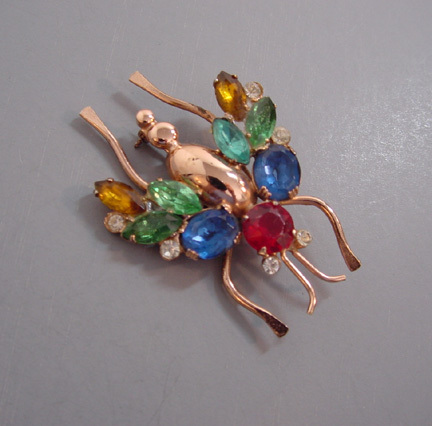 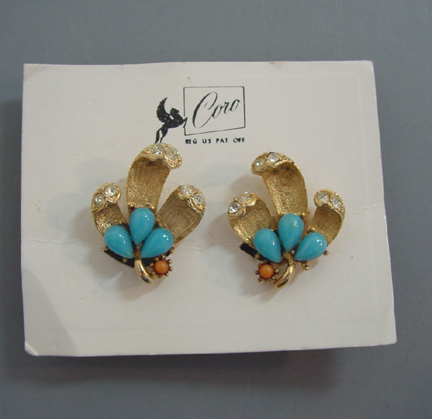 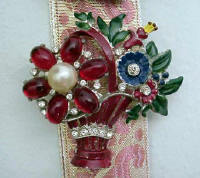 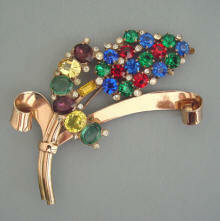 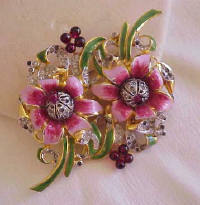 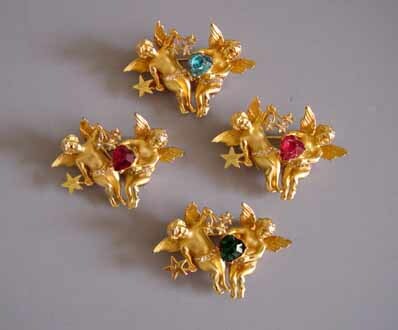 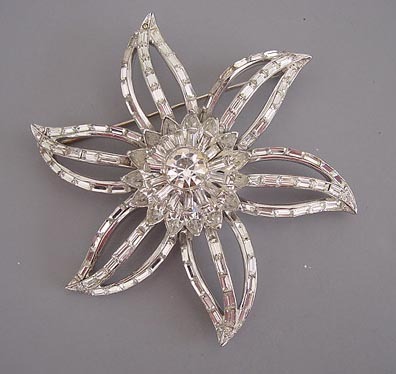 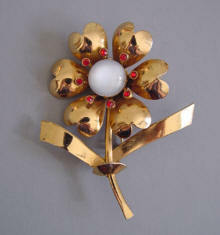 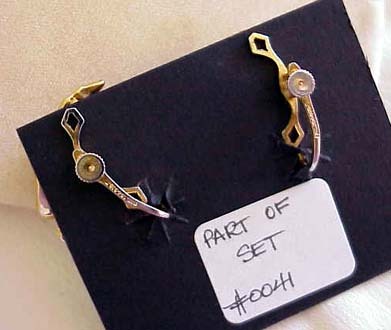 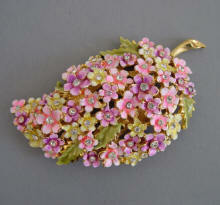 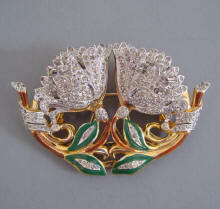 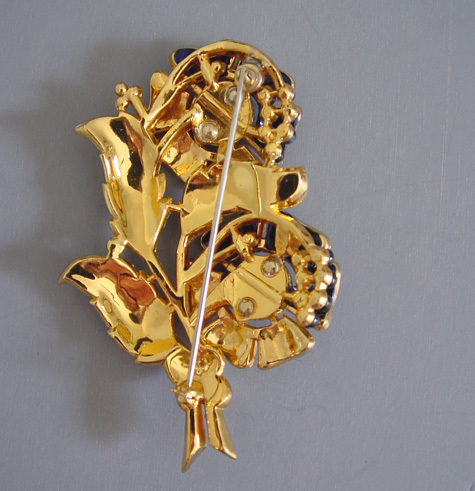 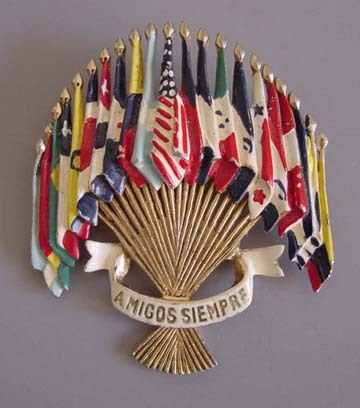 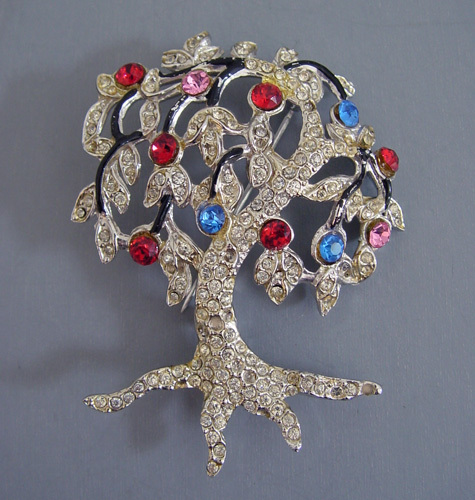 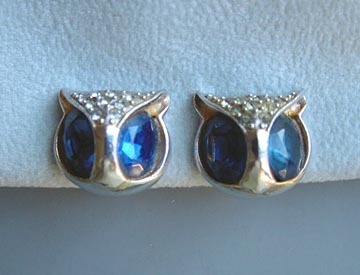 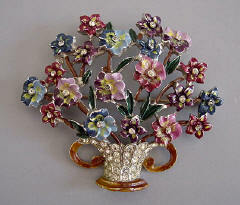 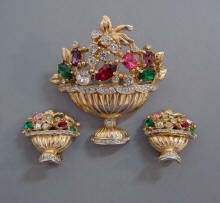 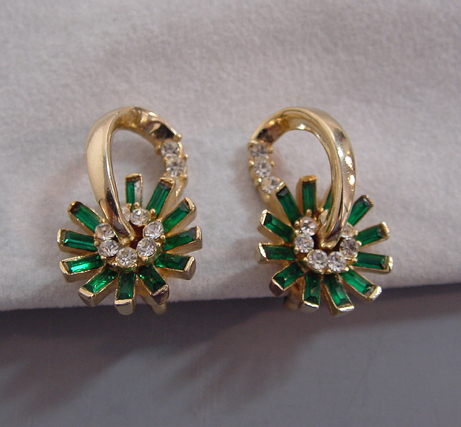 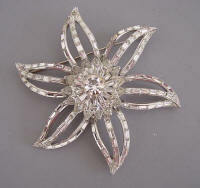 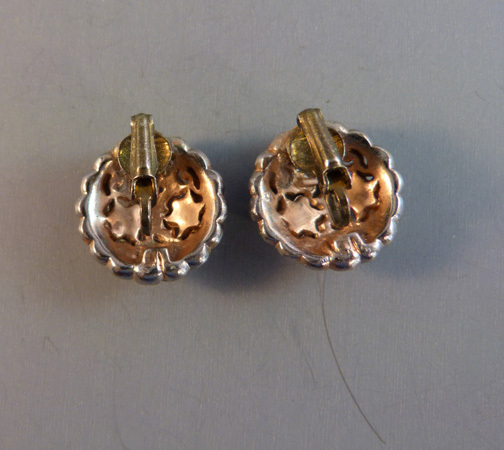 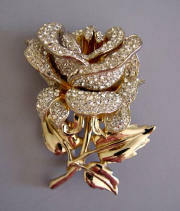 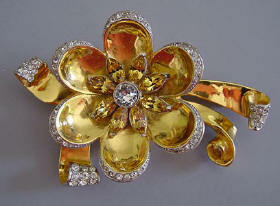 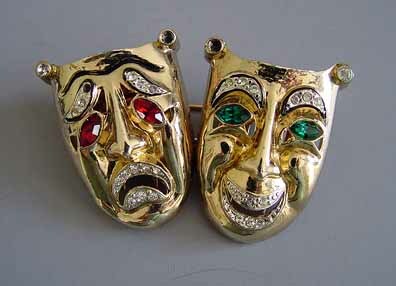 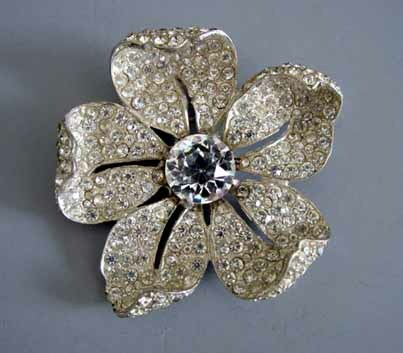 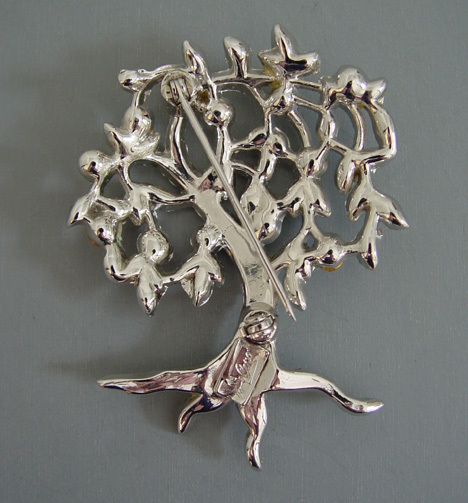 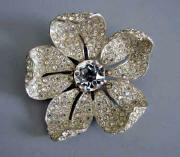 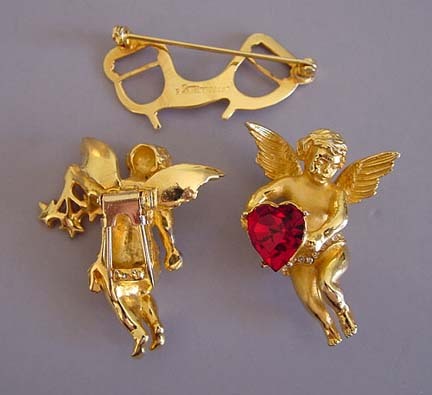 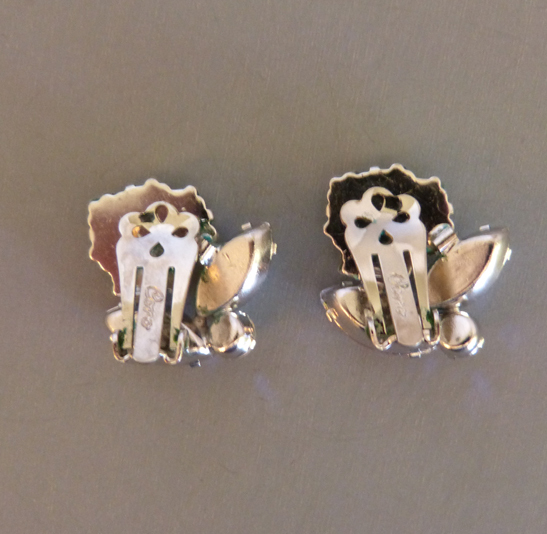 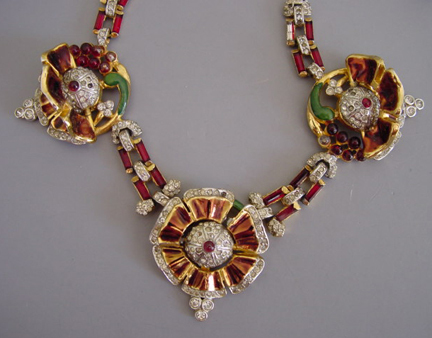 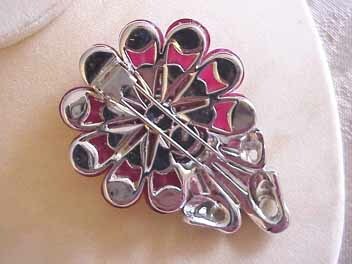 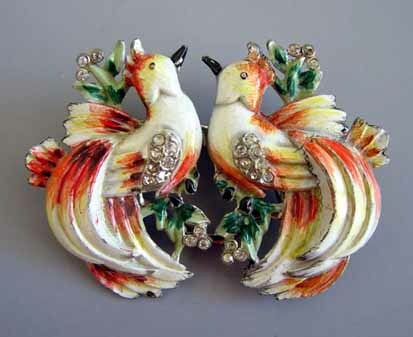 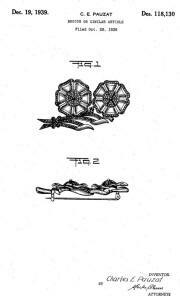 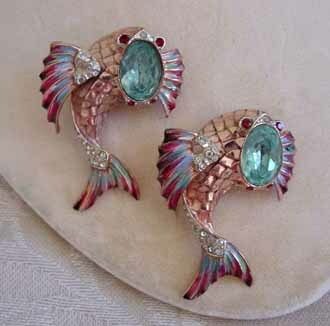 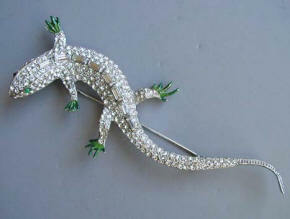 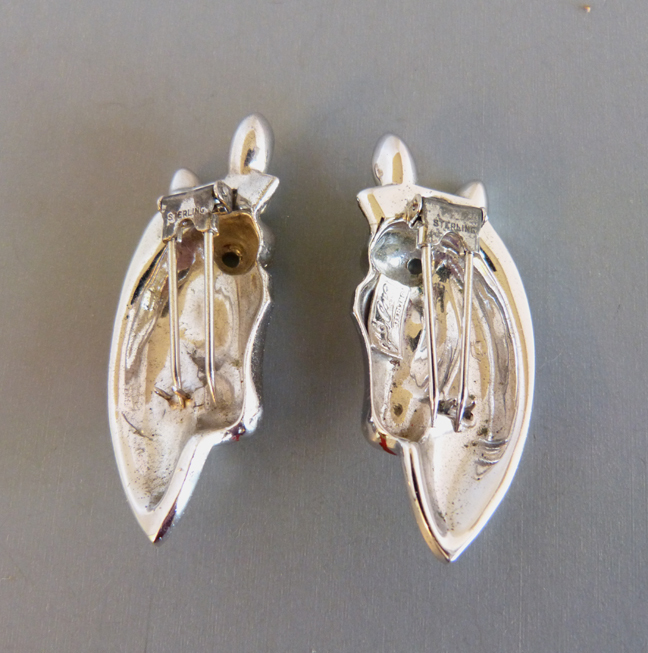 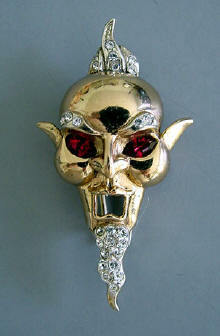 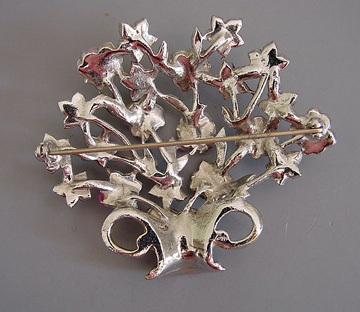 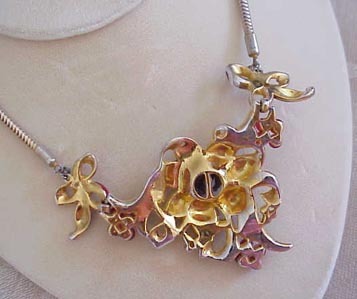 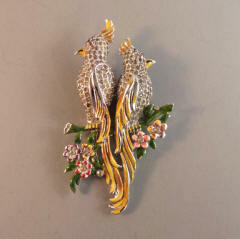 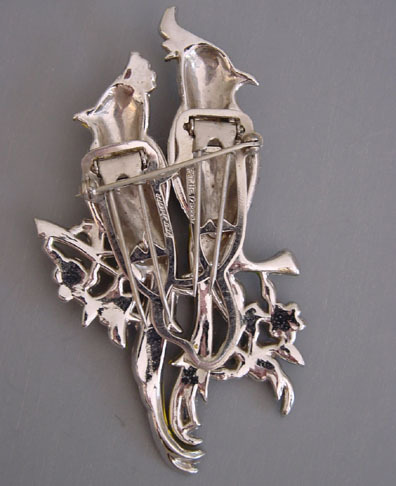 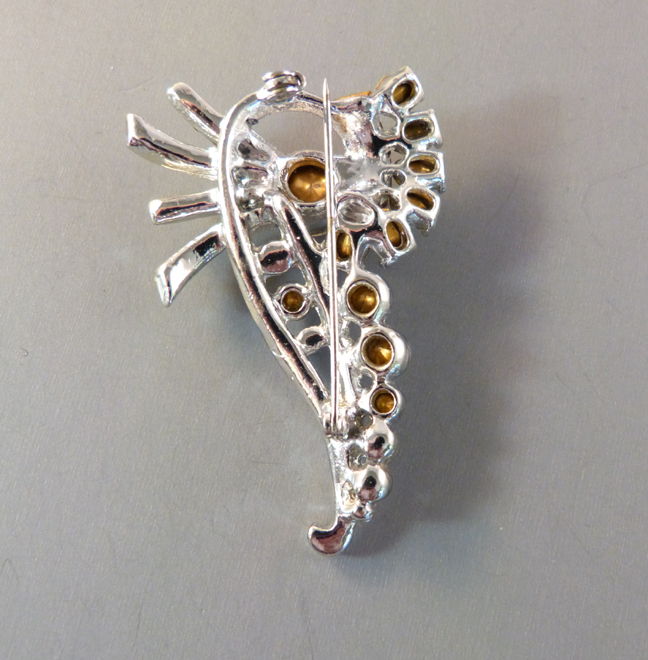 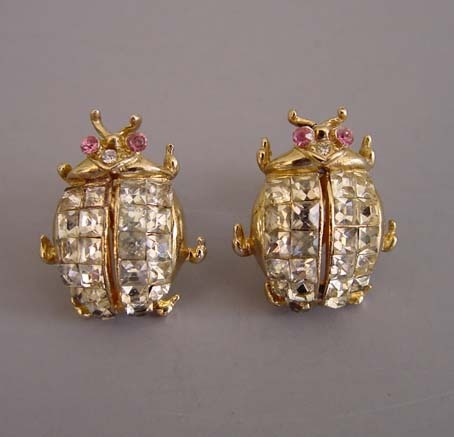 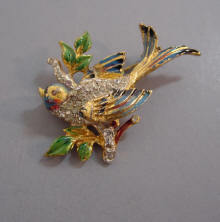 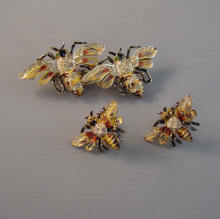 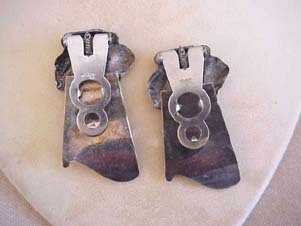 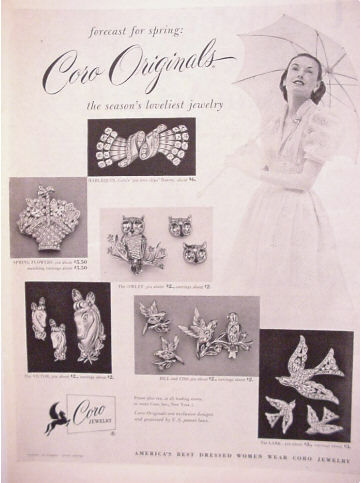 As CORO they are familiar to all costume jewelry lovers. 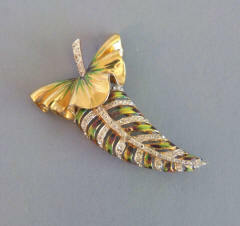 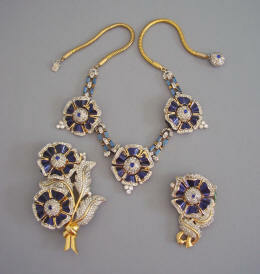 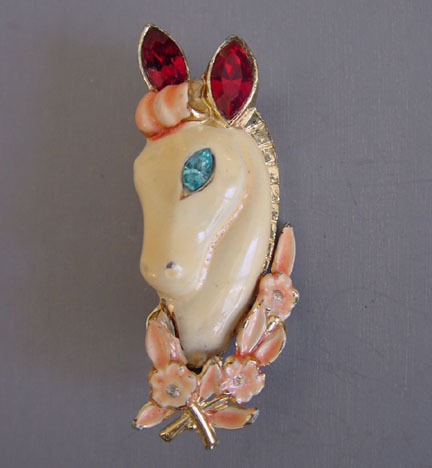 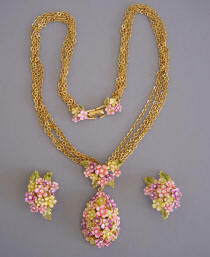 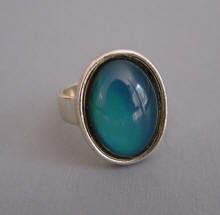 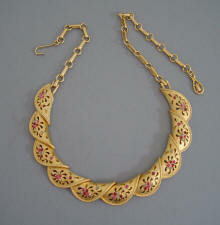 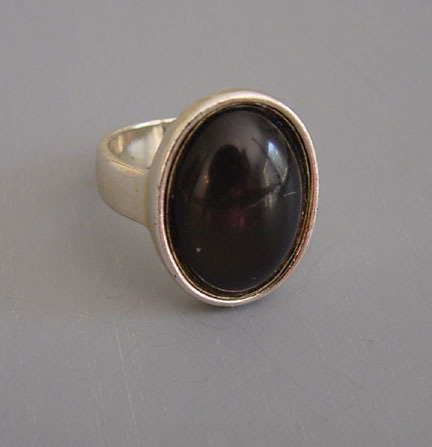 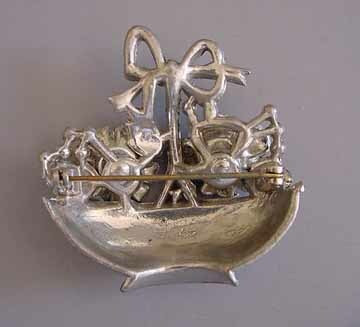 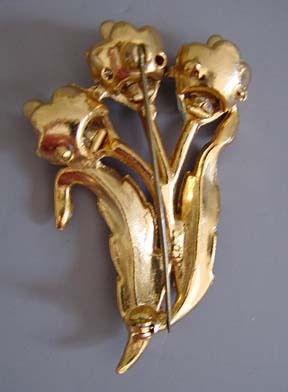 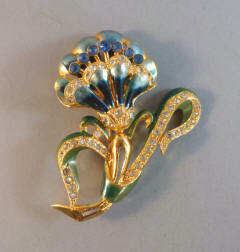 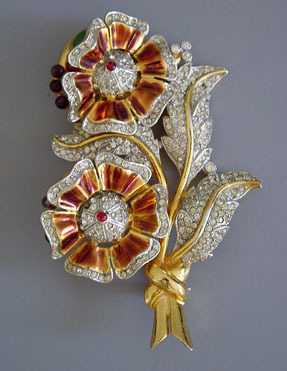 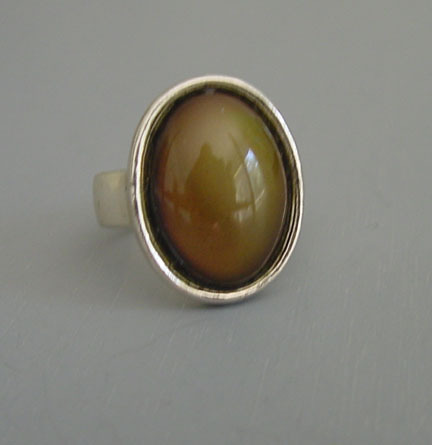 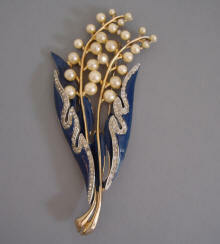 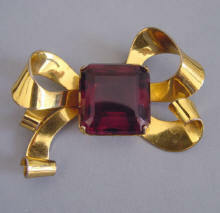 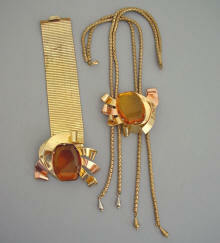 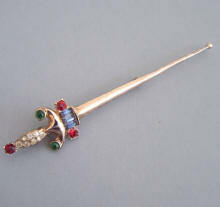 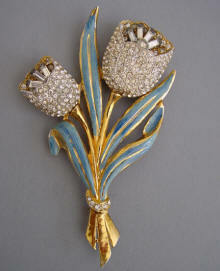 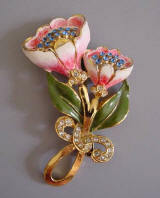 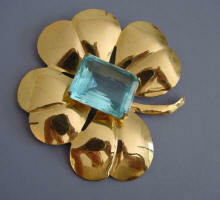 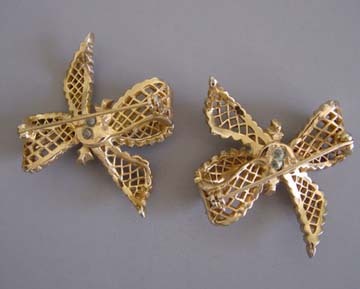 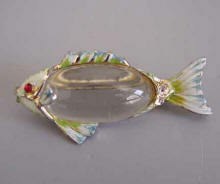 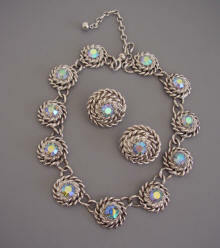 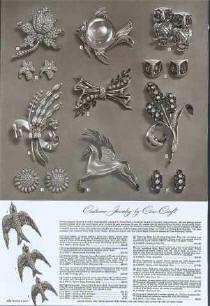 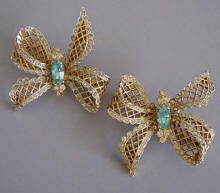 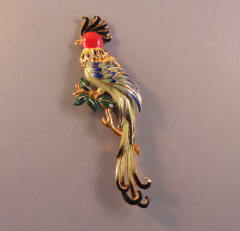 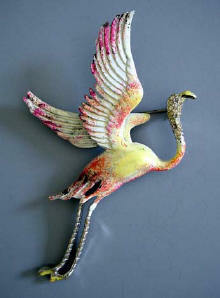 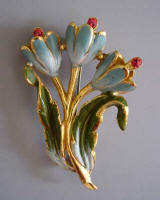 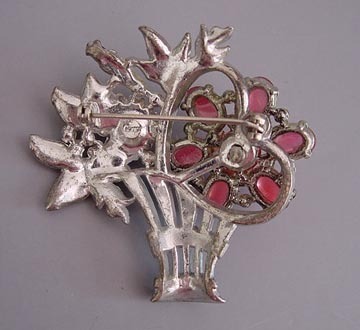 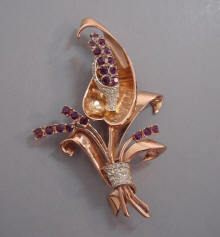 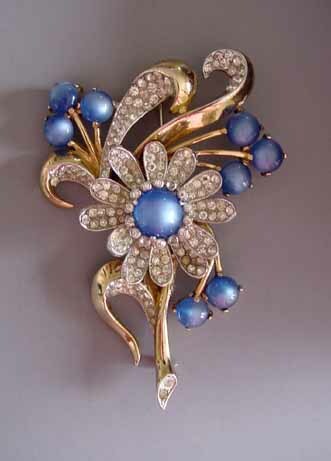 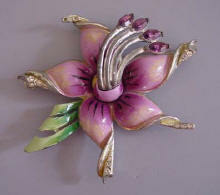 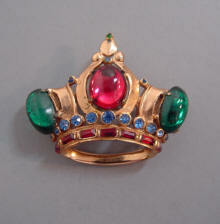 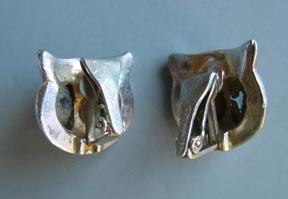 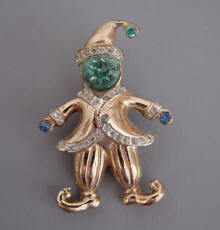 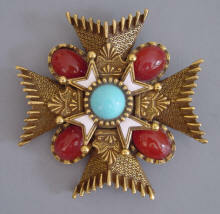 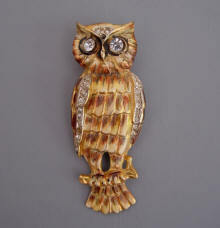 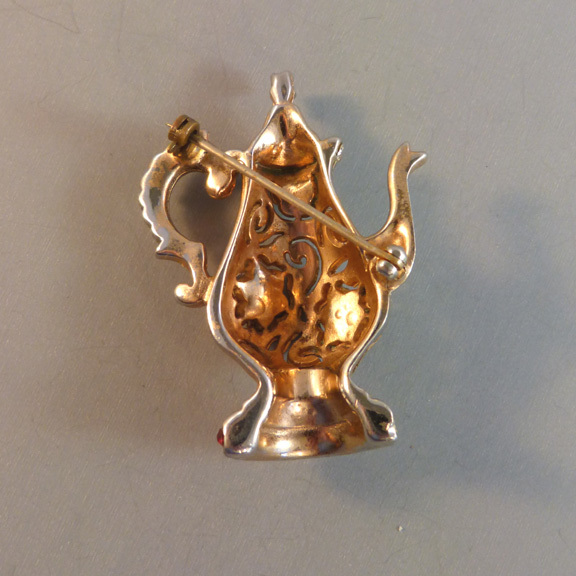 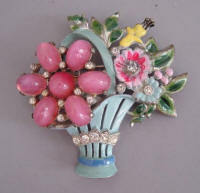 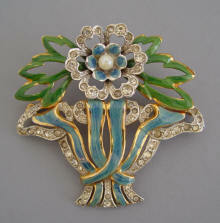 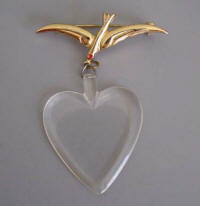 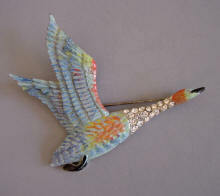 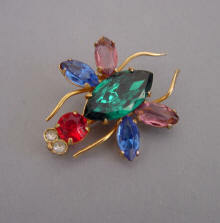 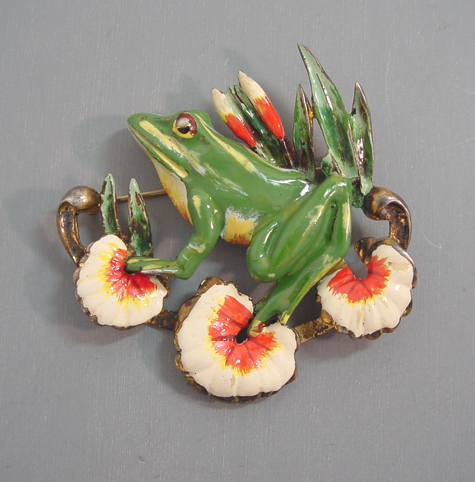 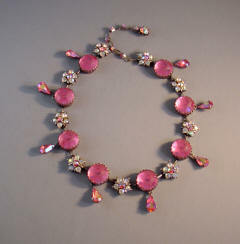 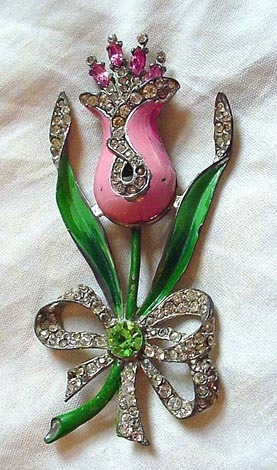 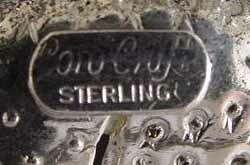 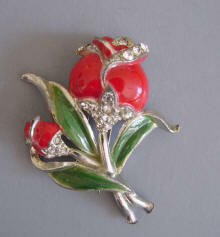 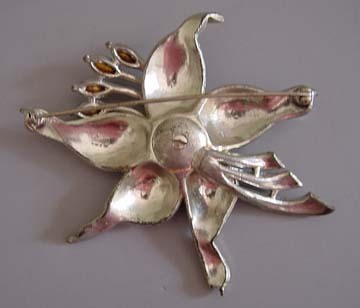 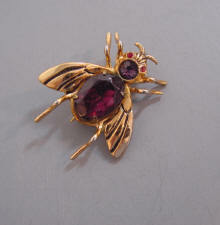 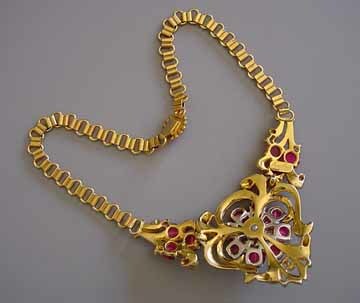 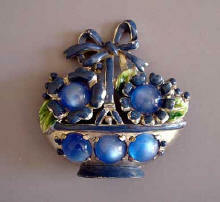 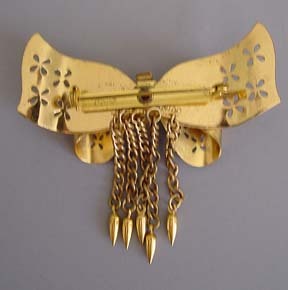 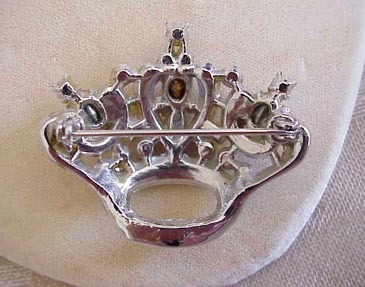 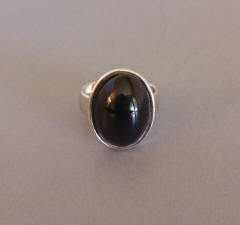 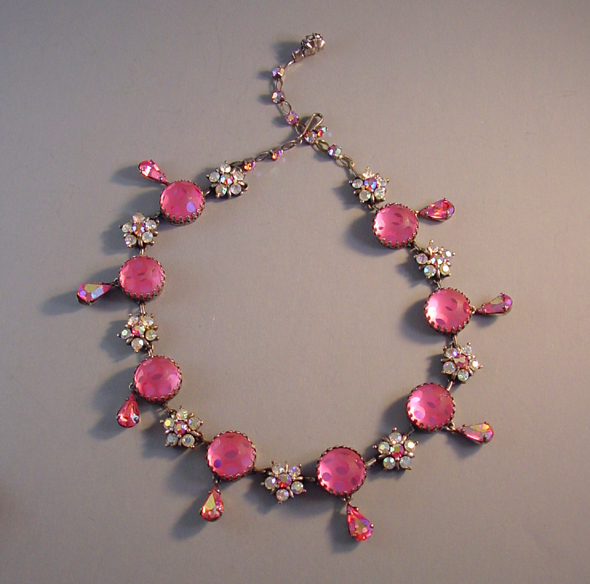 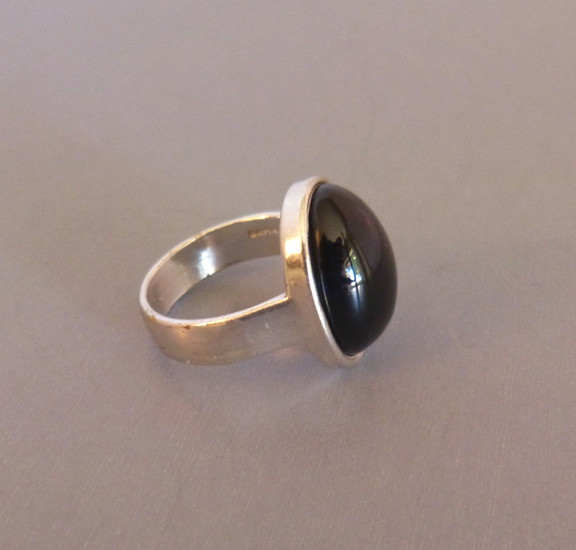 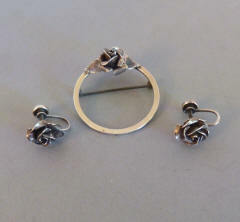 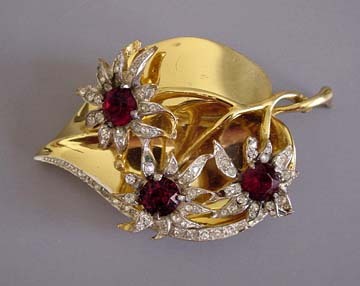 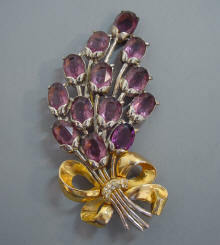 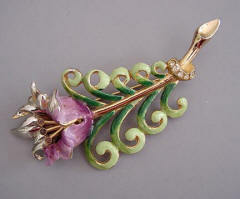 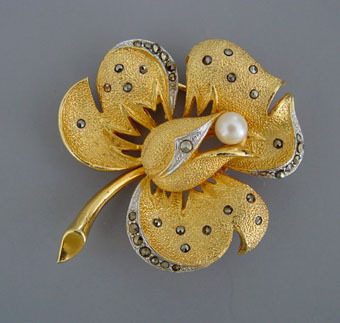 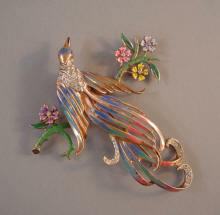 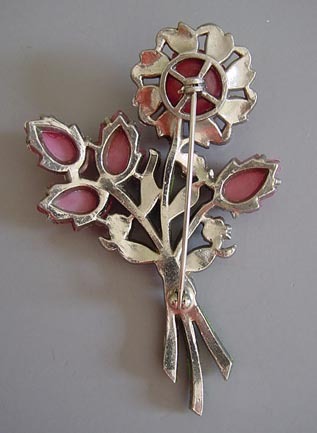 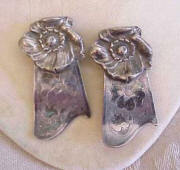 CORO made jewelry from about 1920 until the 1970's and probably did it under more different names than any other maker. 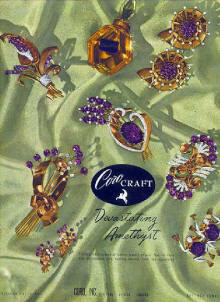 Vendome (1944-1979) , Corocraft (1935-1980), and Duette are just three examples. 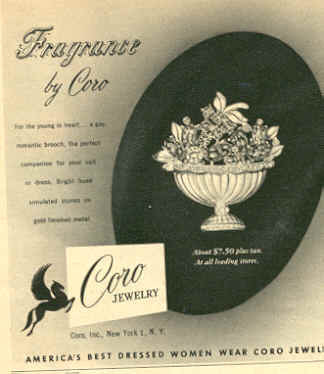 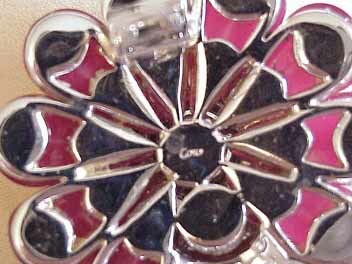 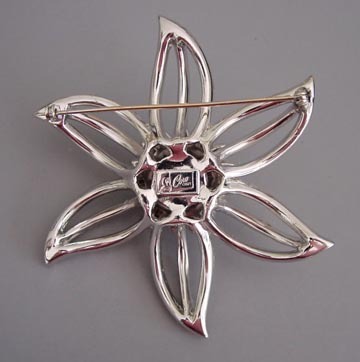 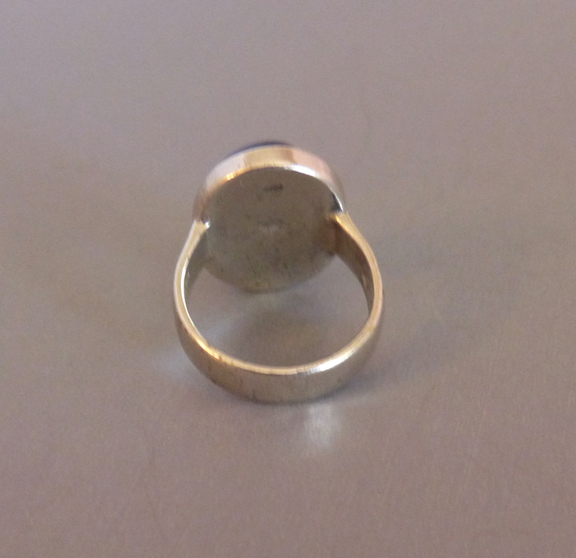 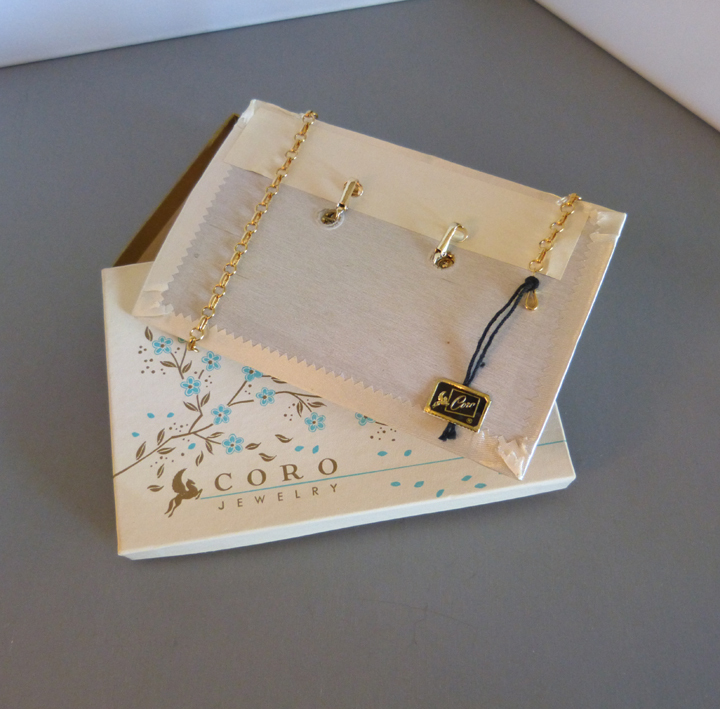 In general, the Coro mark was on the more modestly priced jewelry. 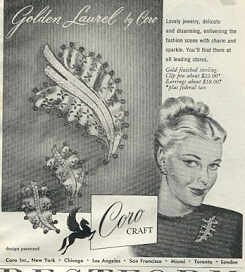 Corocraft, Vendome and Francois were the higher priced lines. 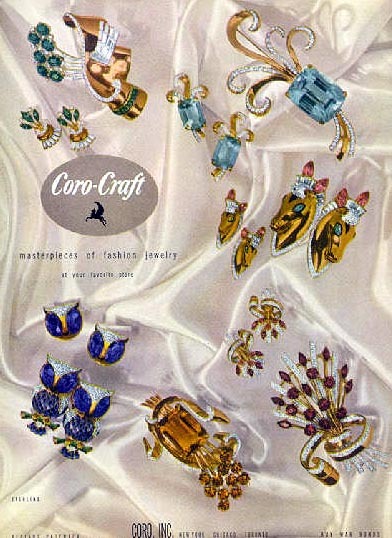 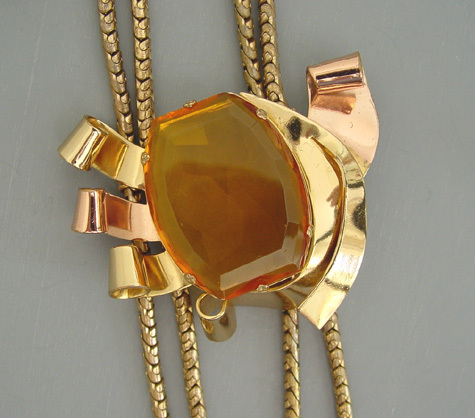 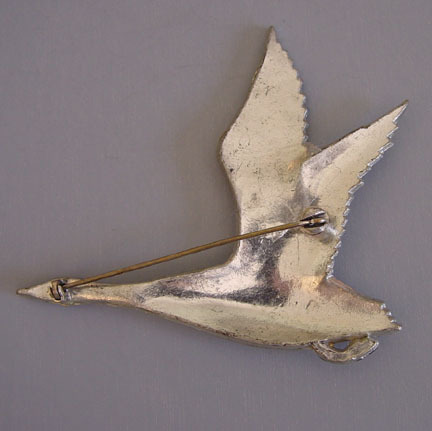 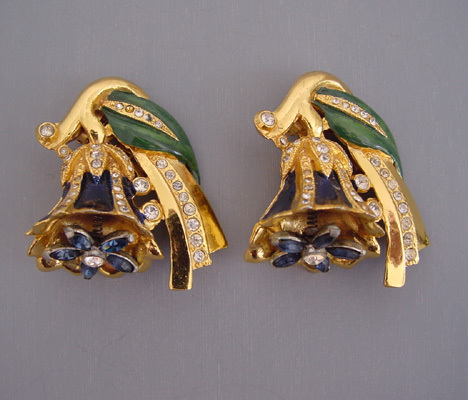 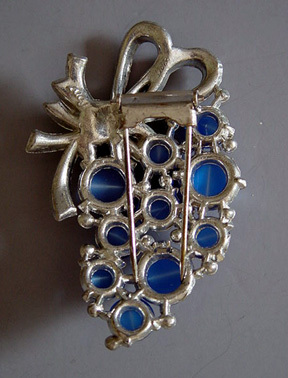 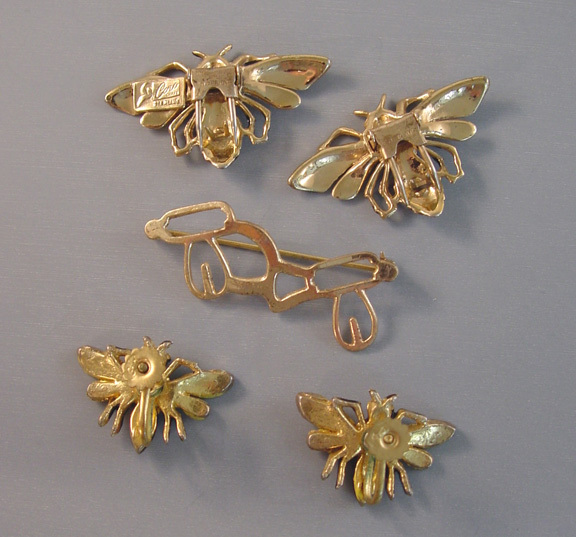 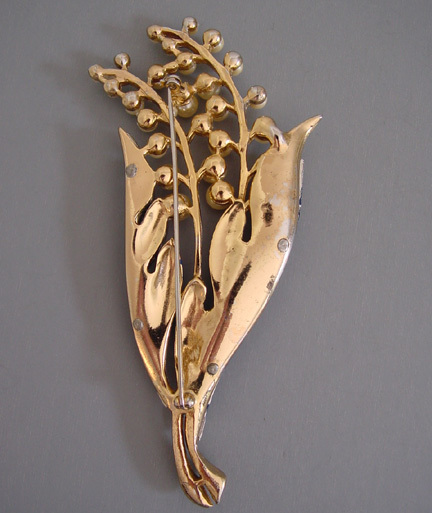 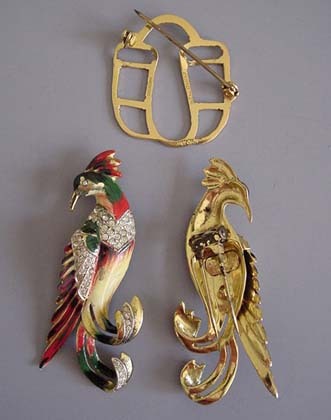 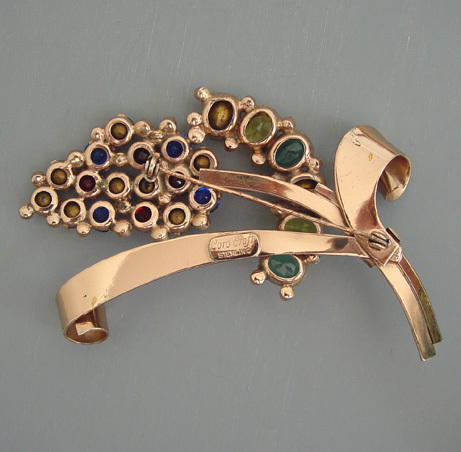 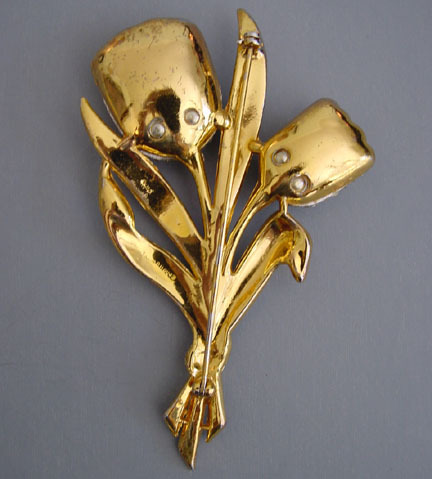 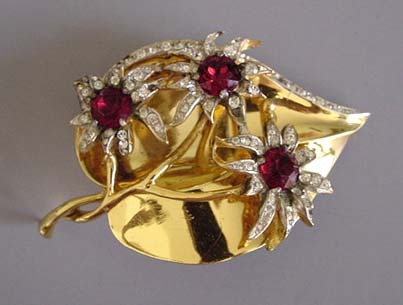 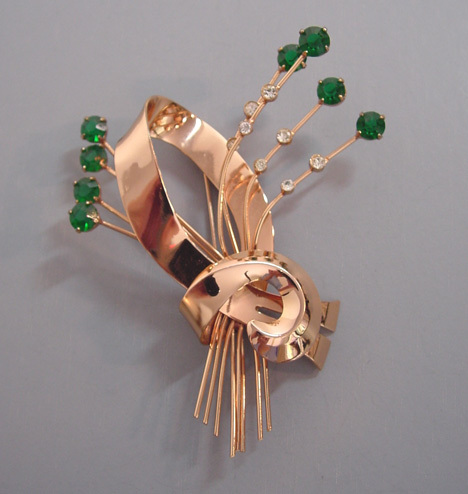 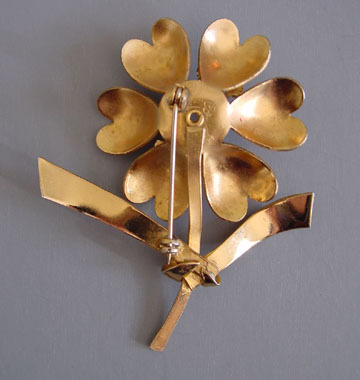 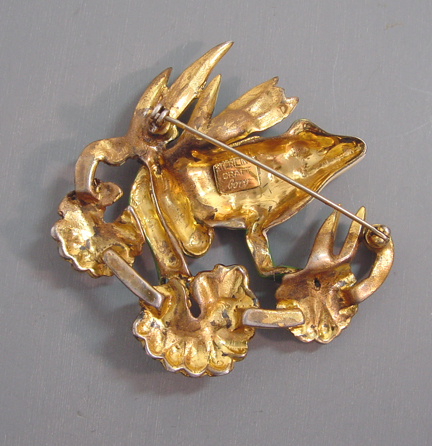 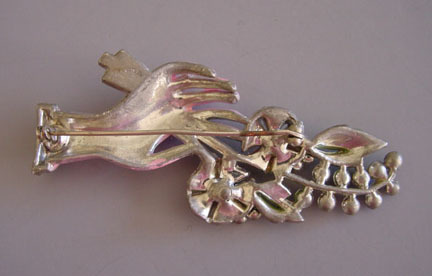 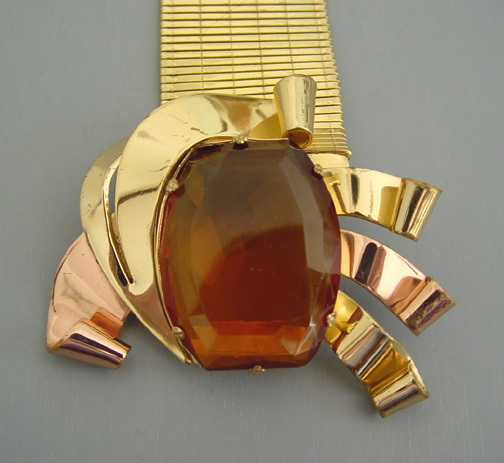 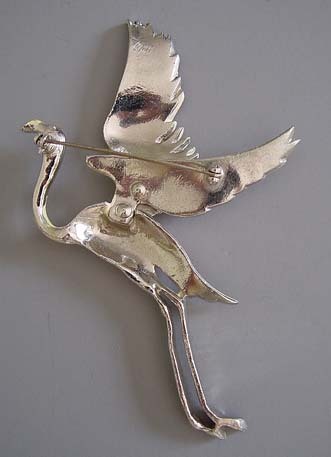 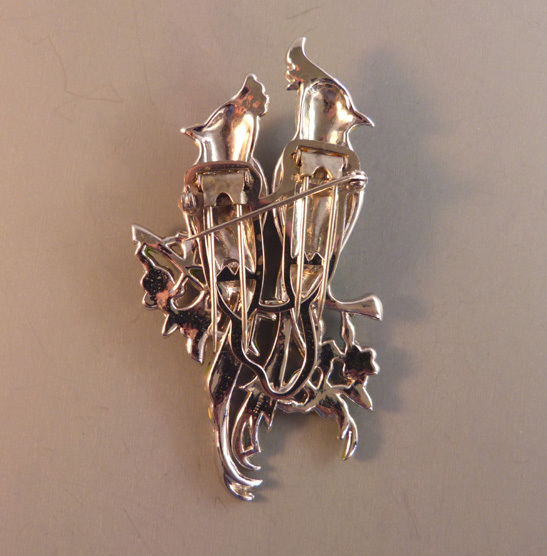 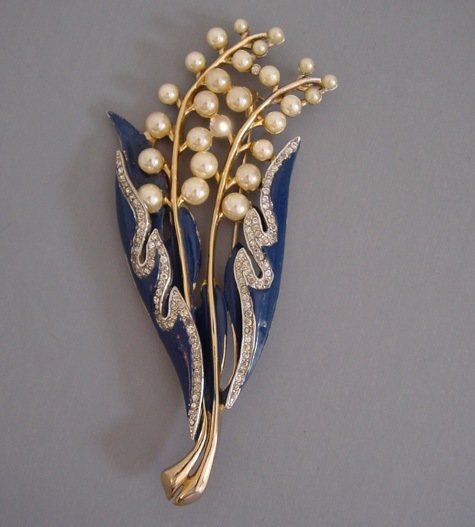 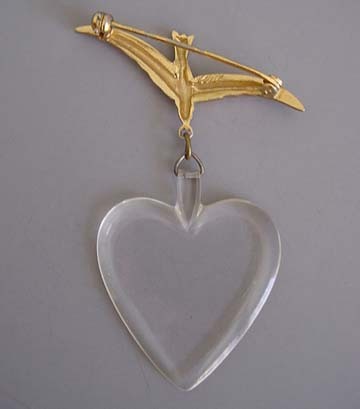 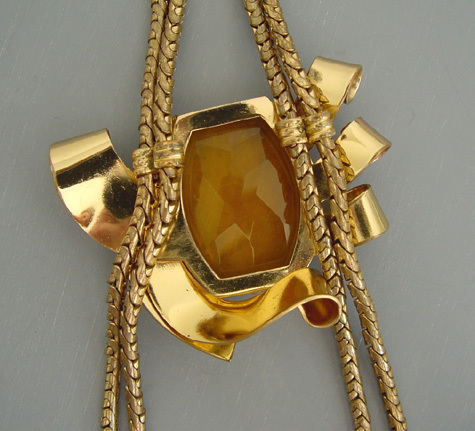 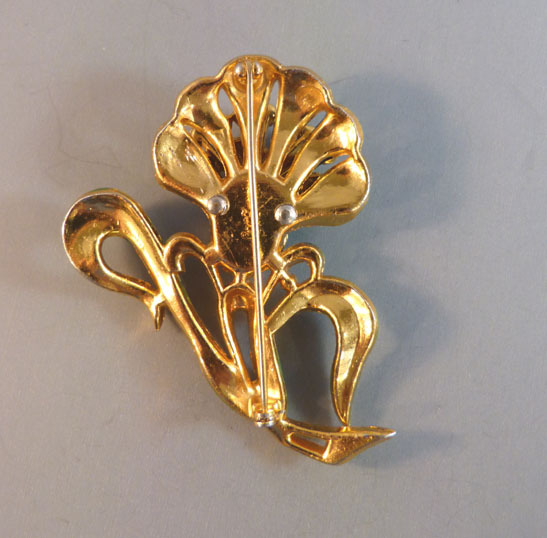 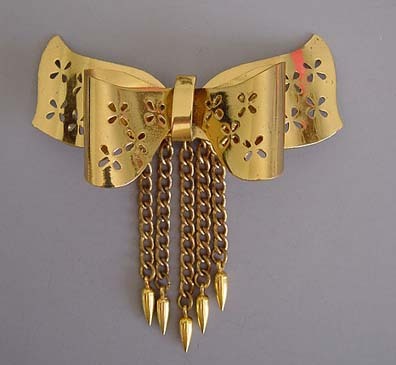 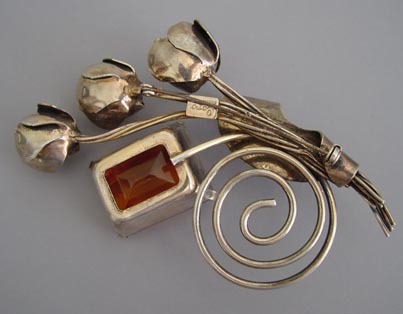 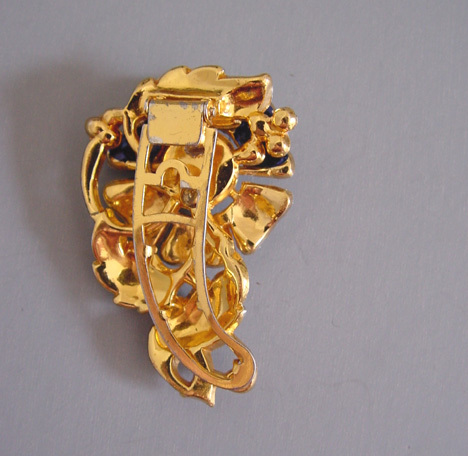 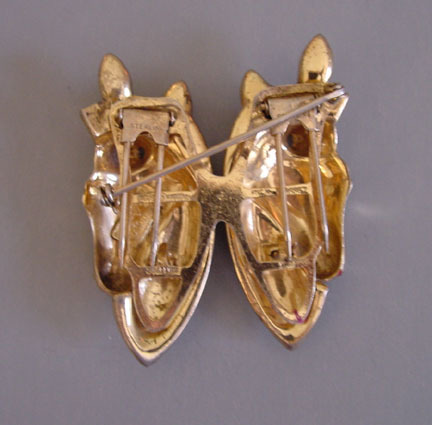 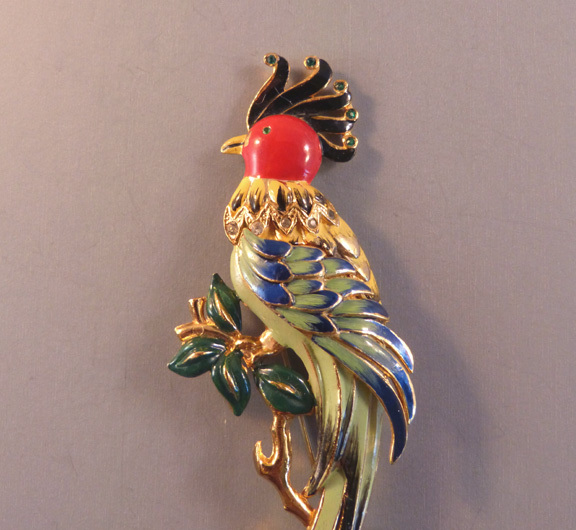 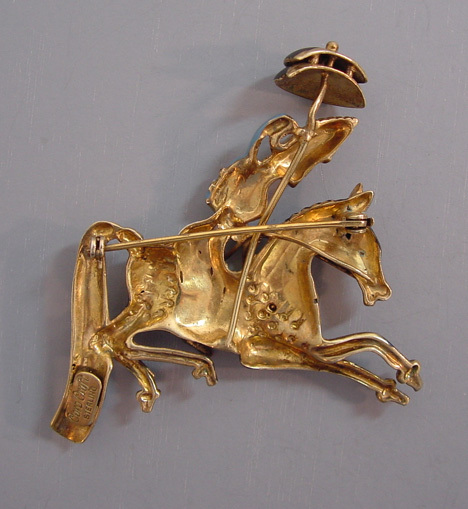 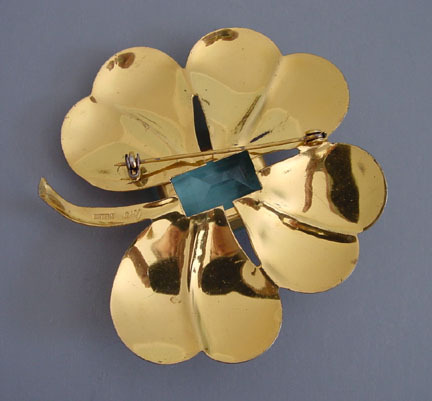 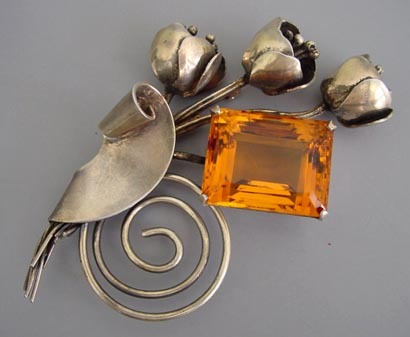 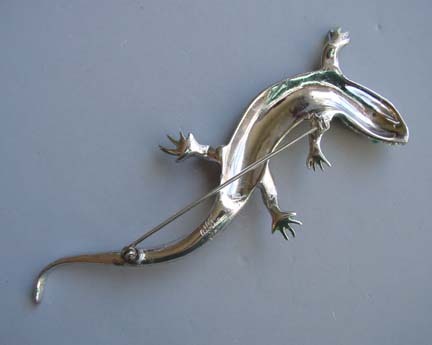 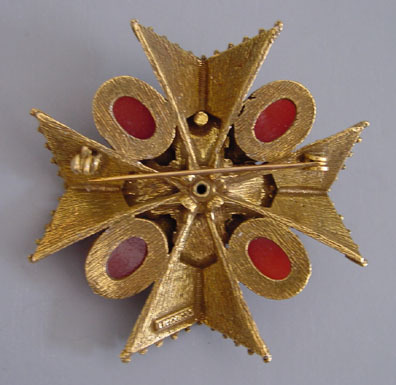 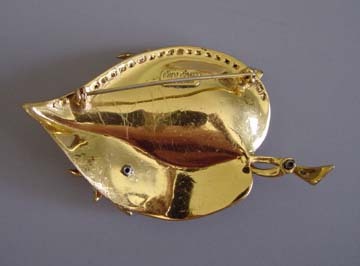 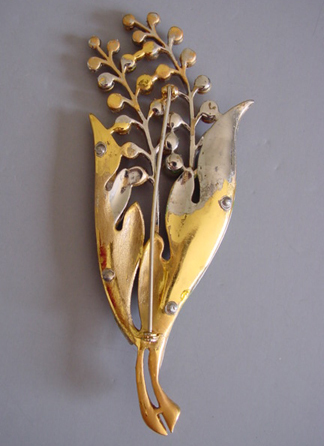 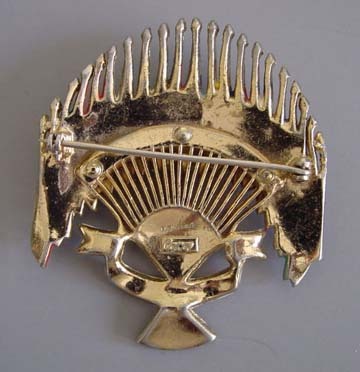 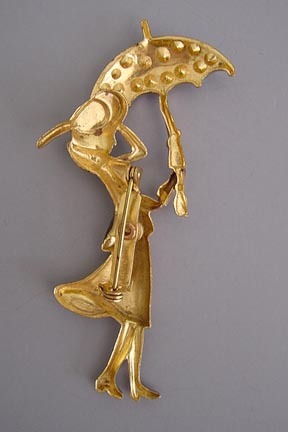 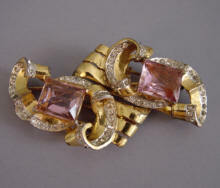 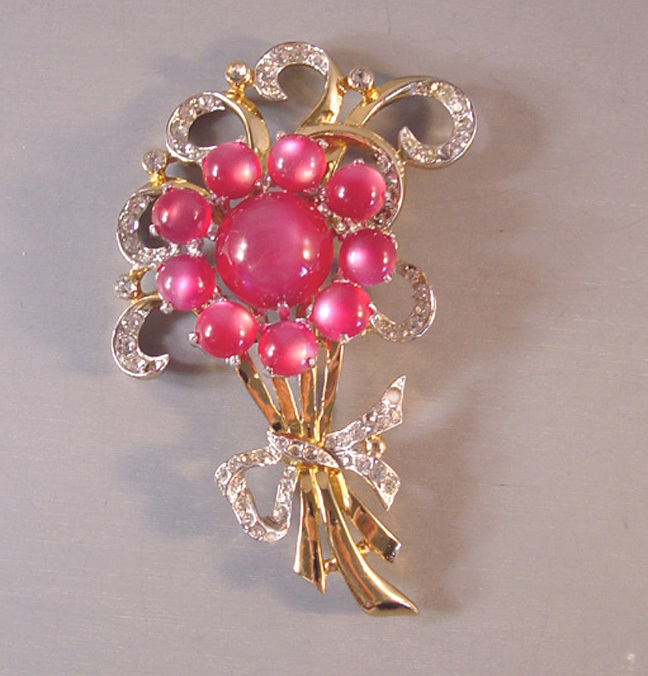 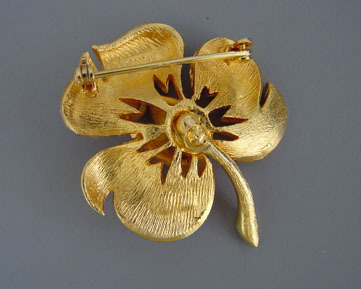 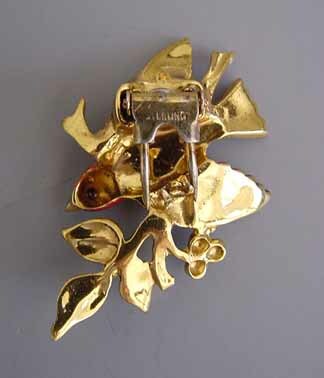 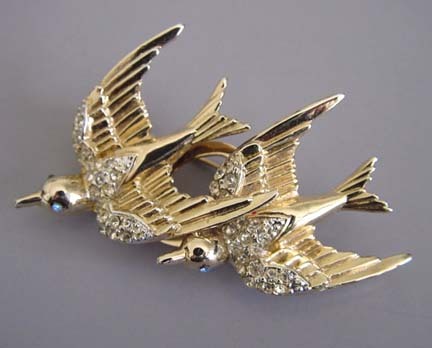 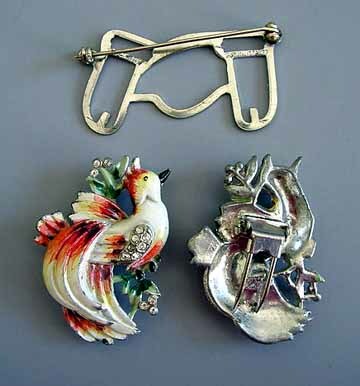 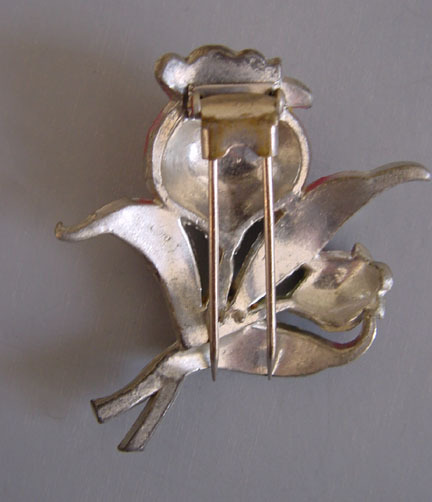 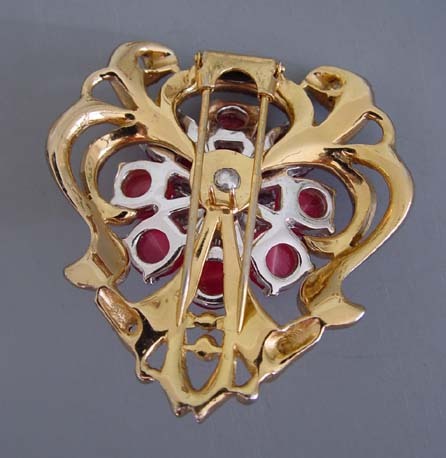 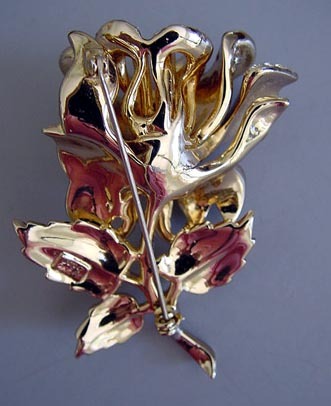 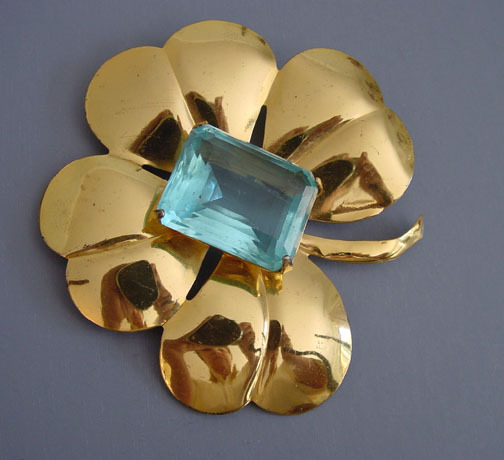 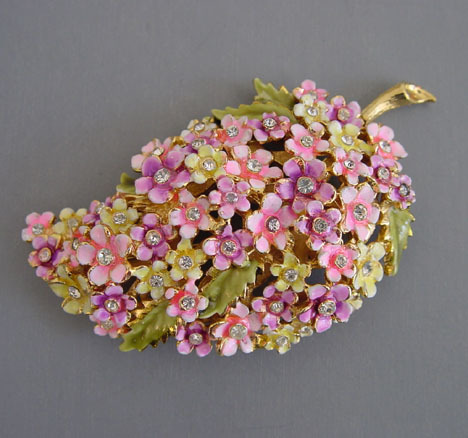 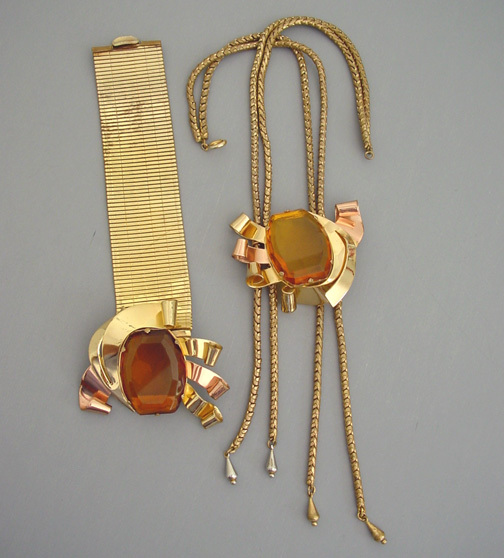 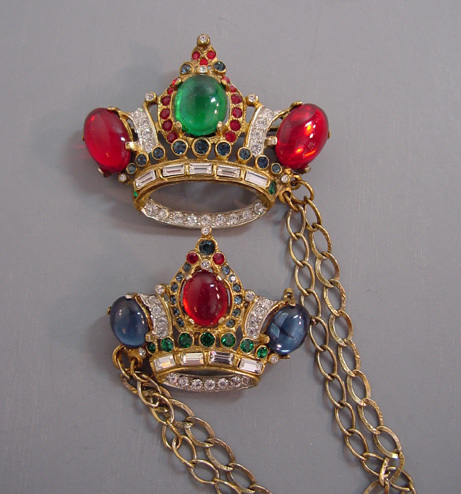 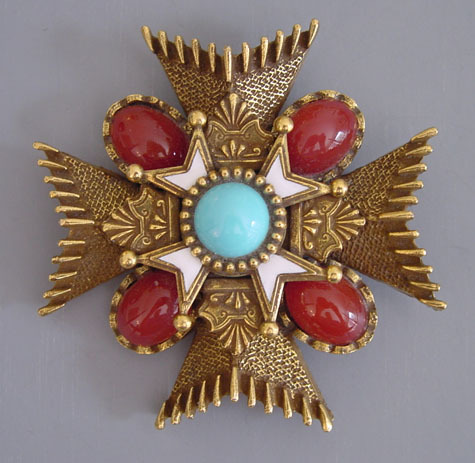 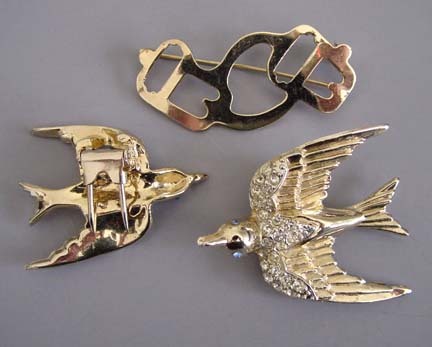 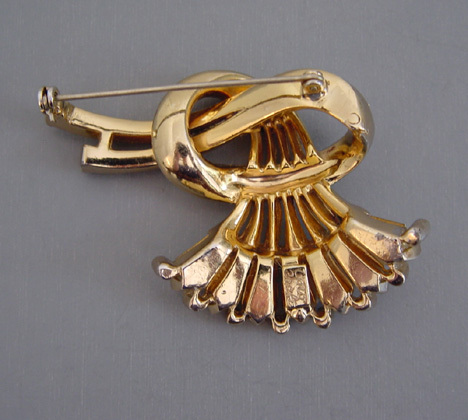 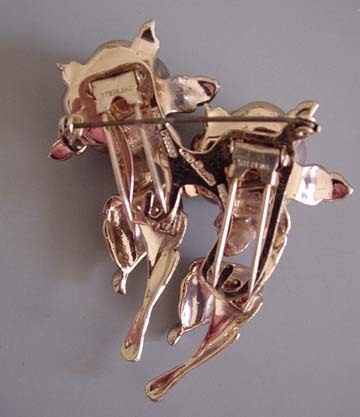 Adolph Katz was one of the best known of the designers, but there were many others responsible for the wonderful style of Coro jewelry. 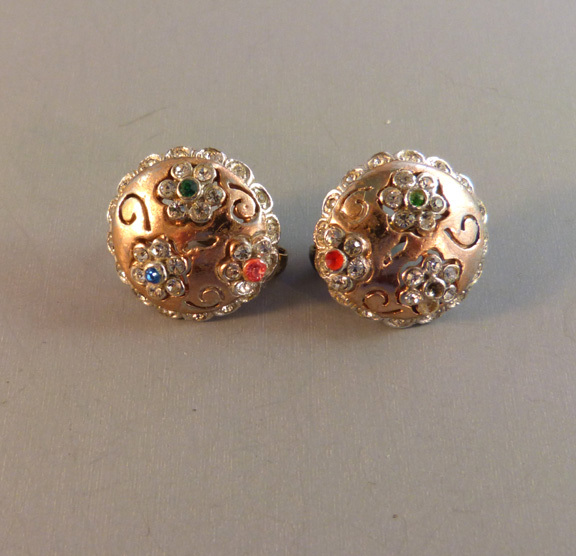 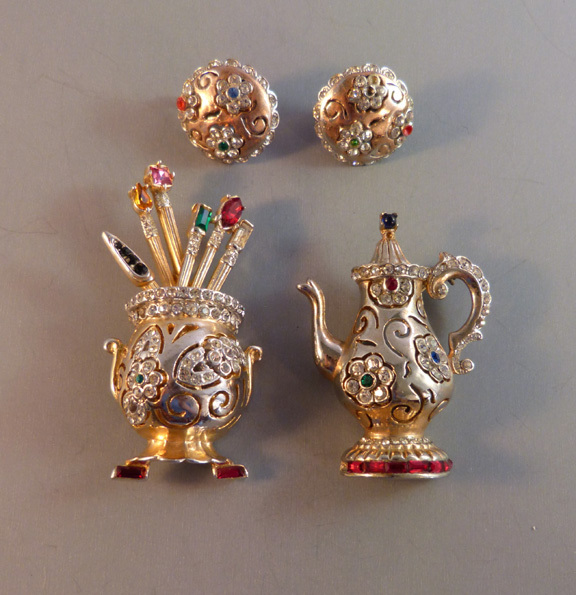 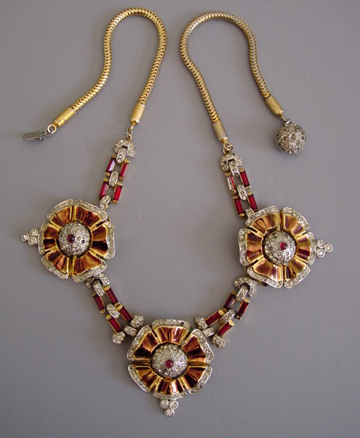 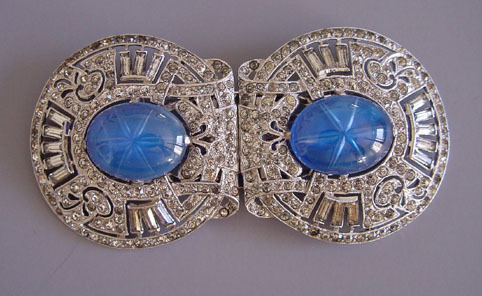 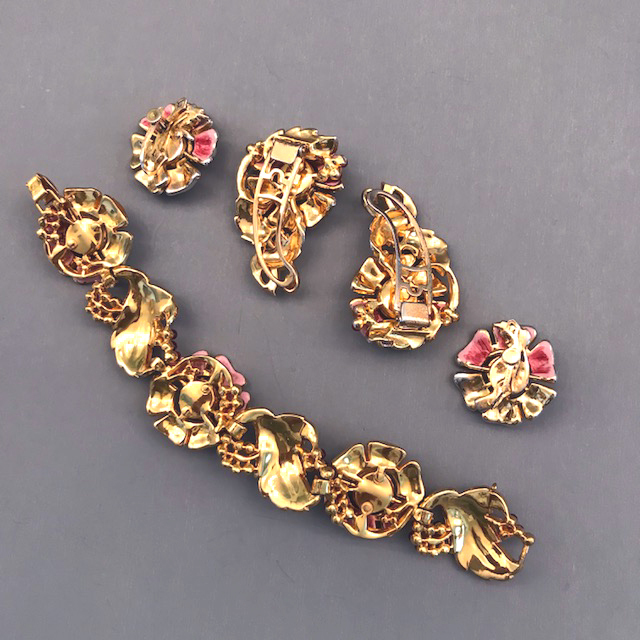 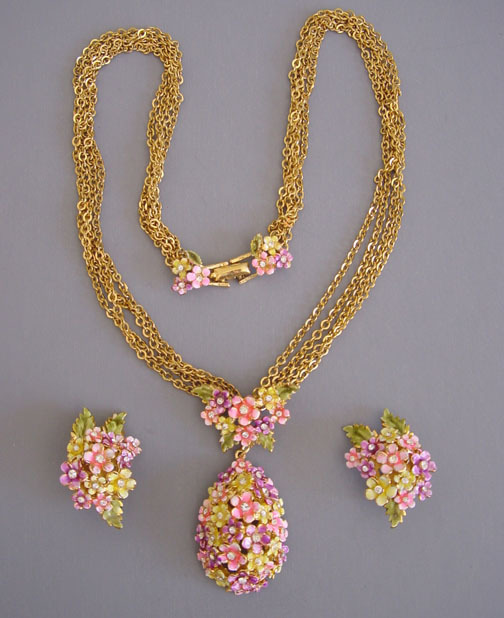 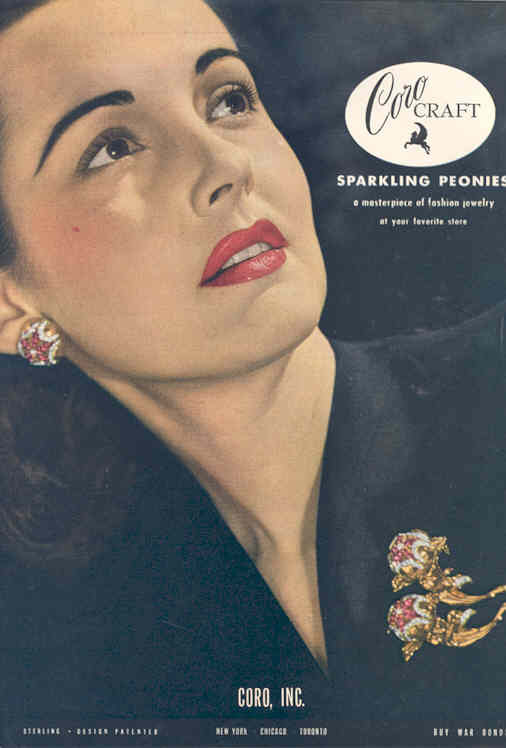 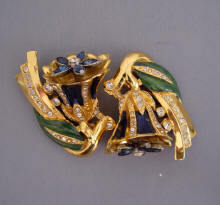 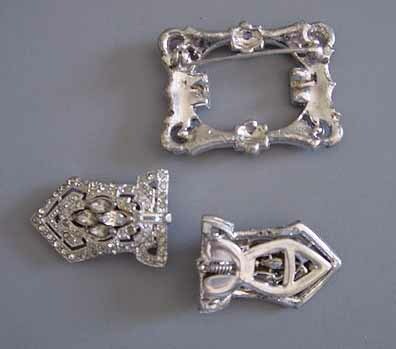 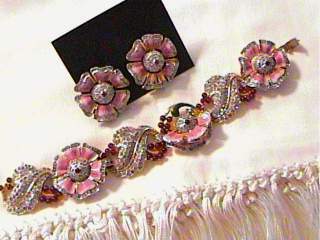 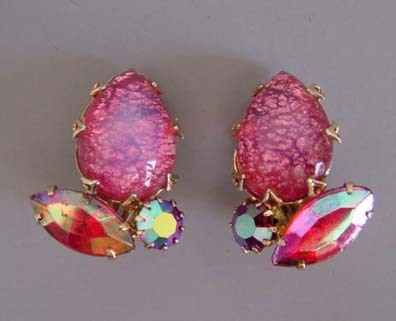 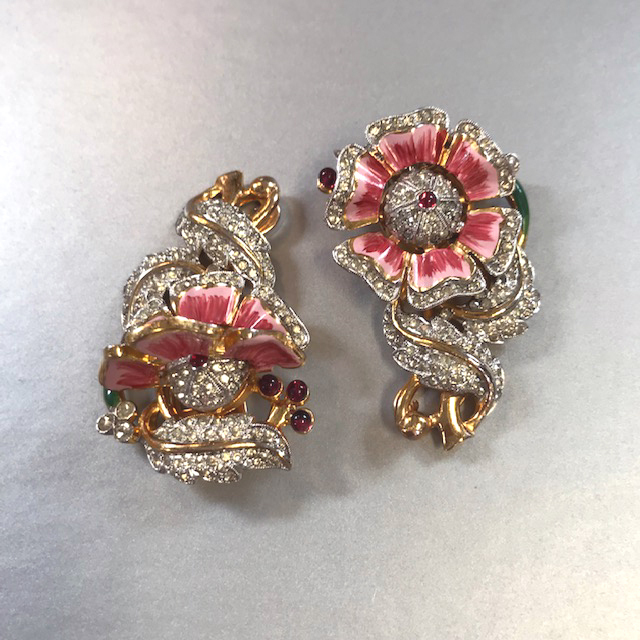 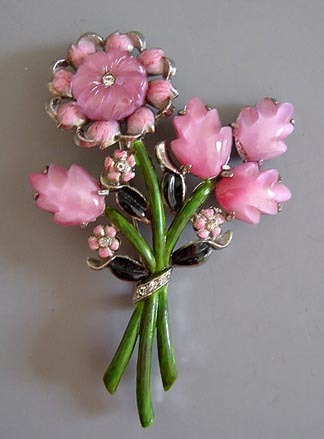 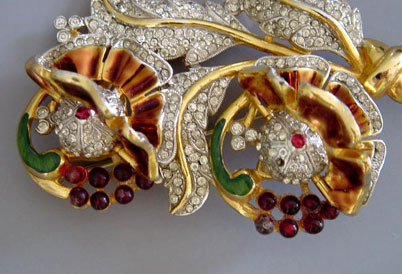 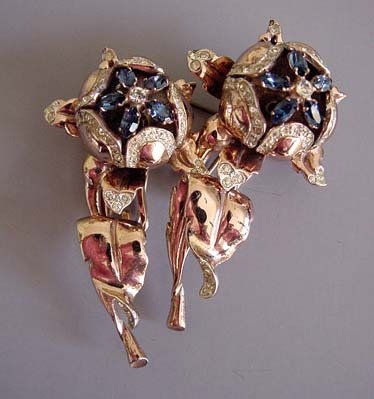 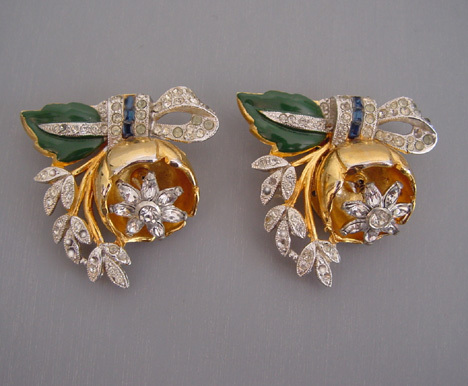 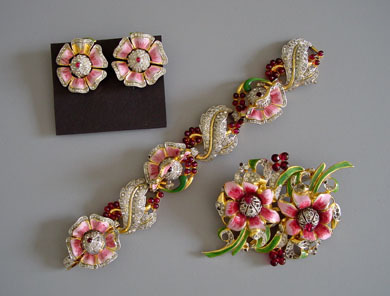 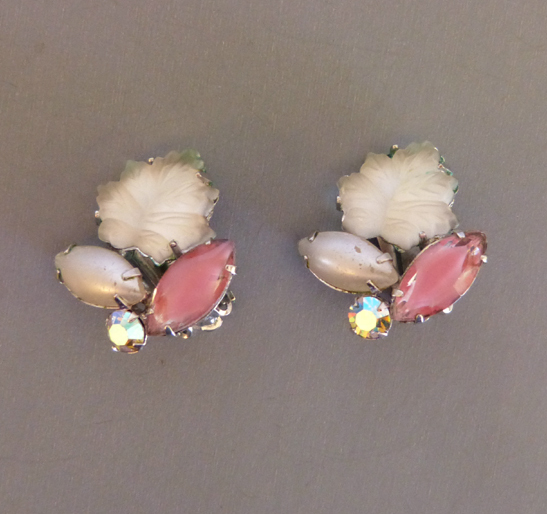 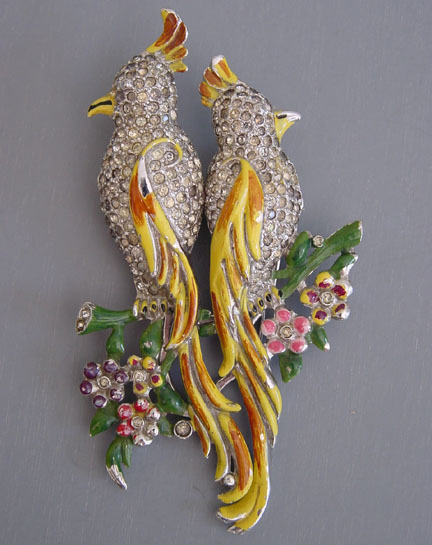 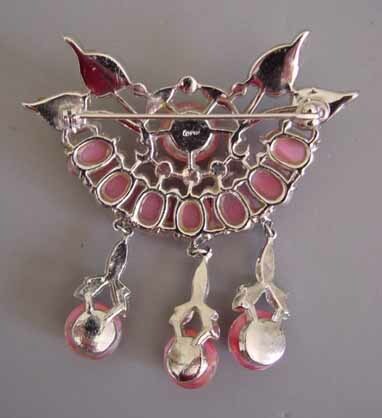 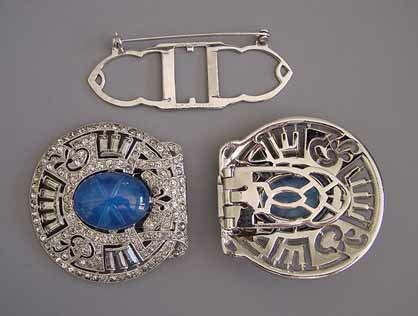 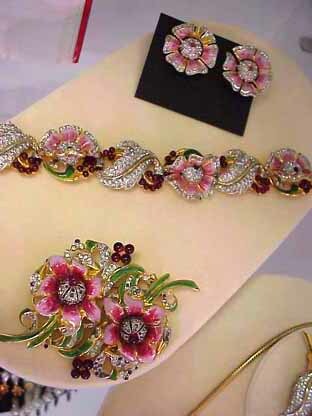 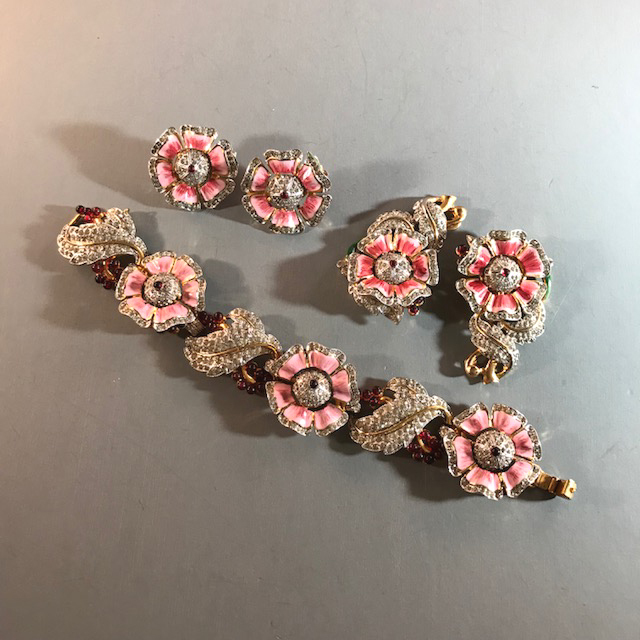 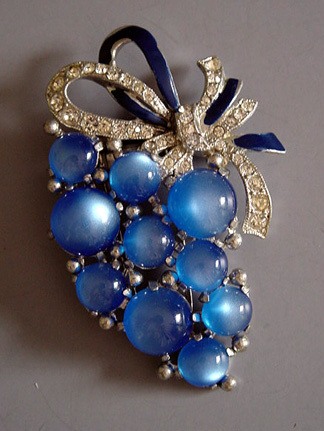 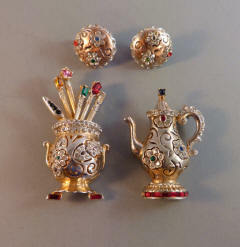 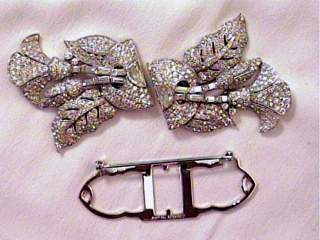 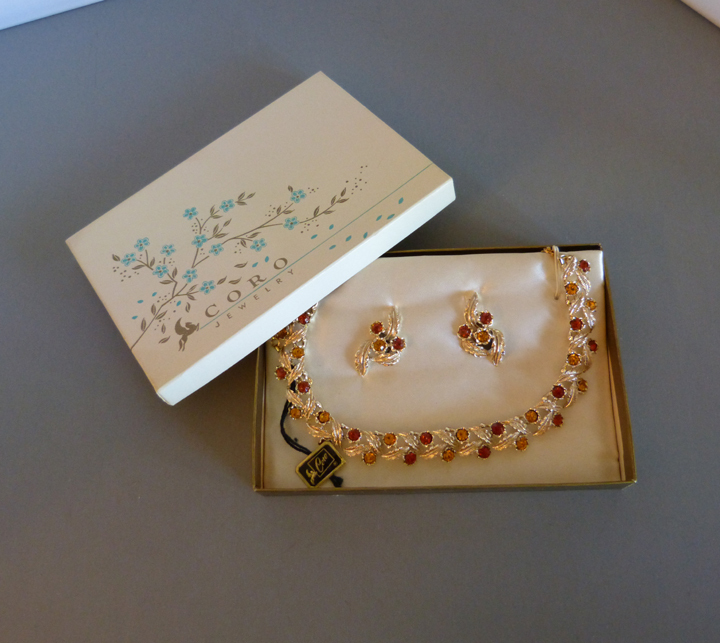 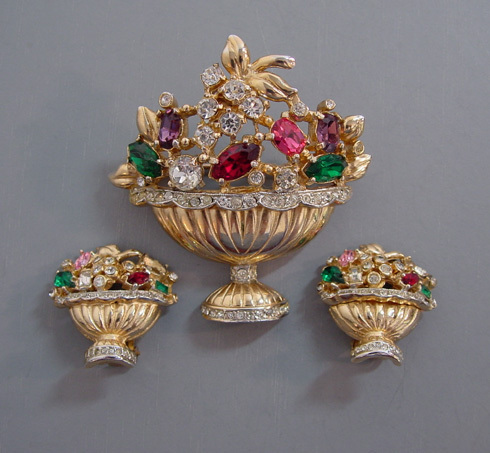 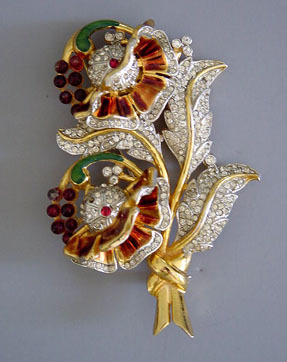 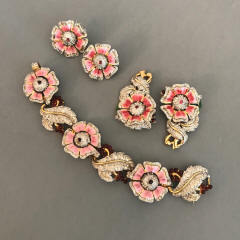 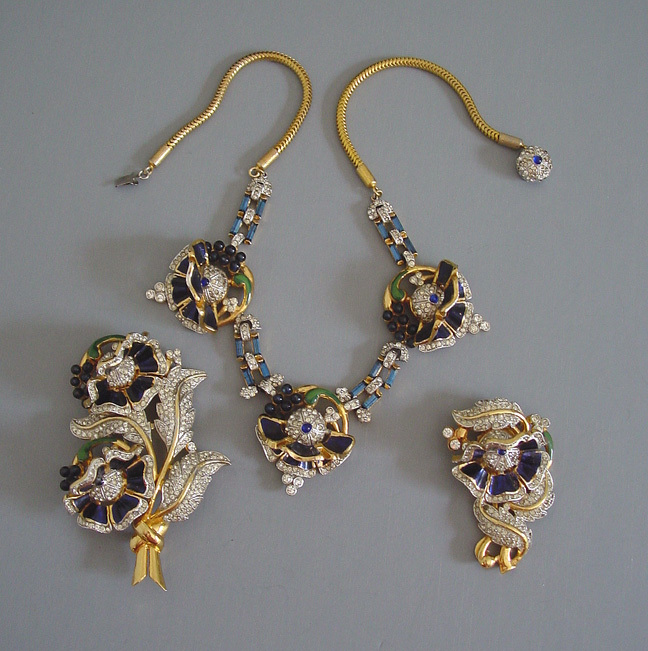 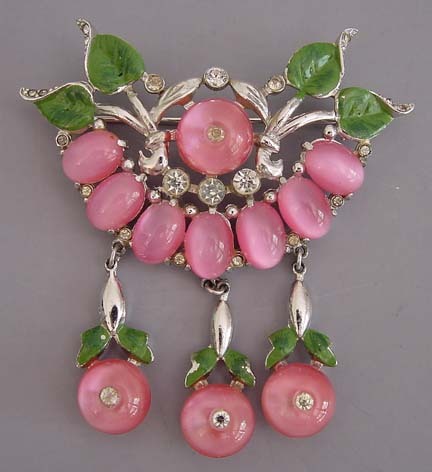 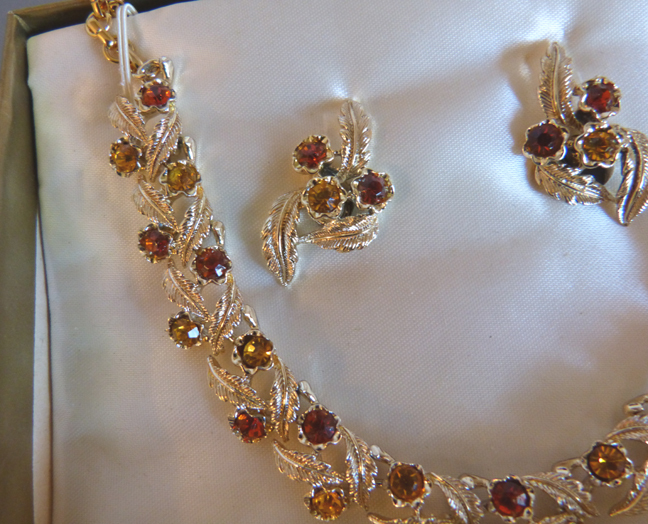 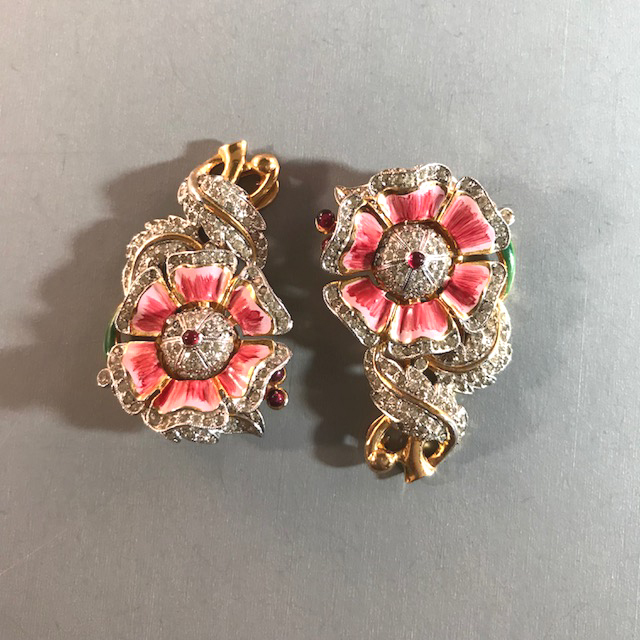 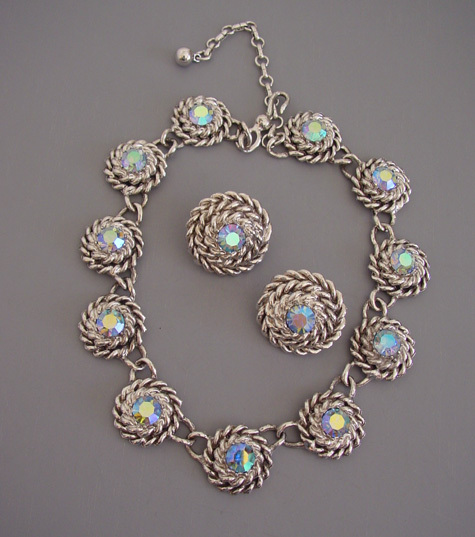 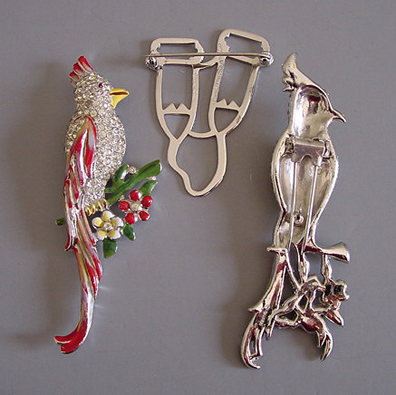 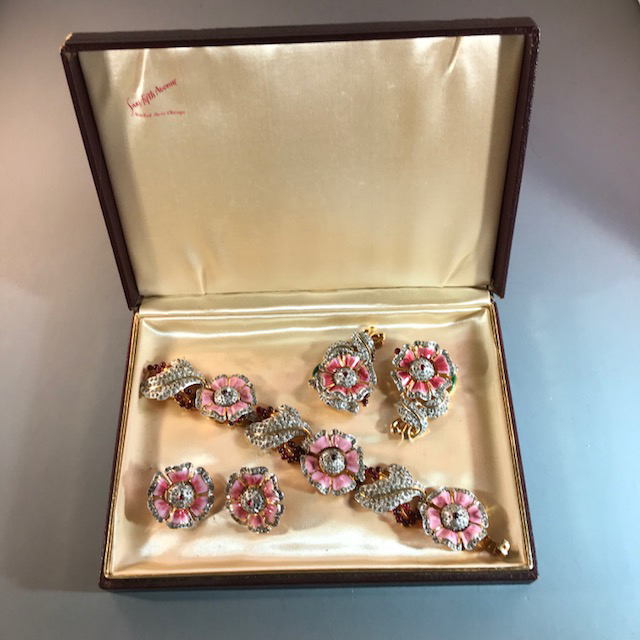 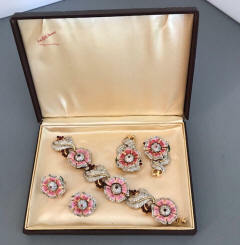 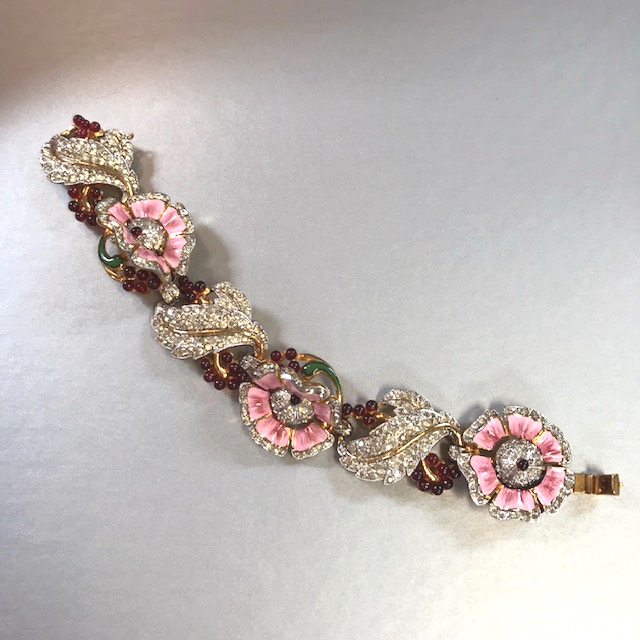 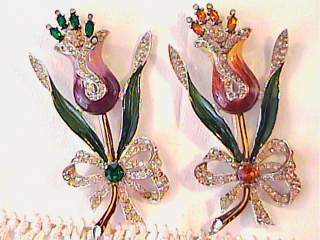 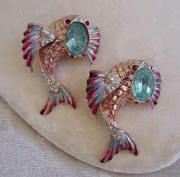 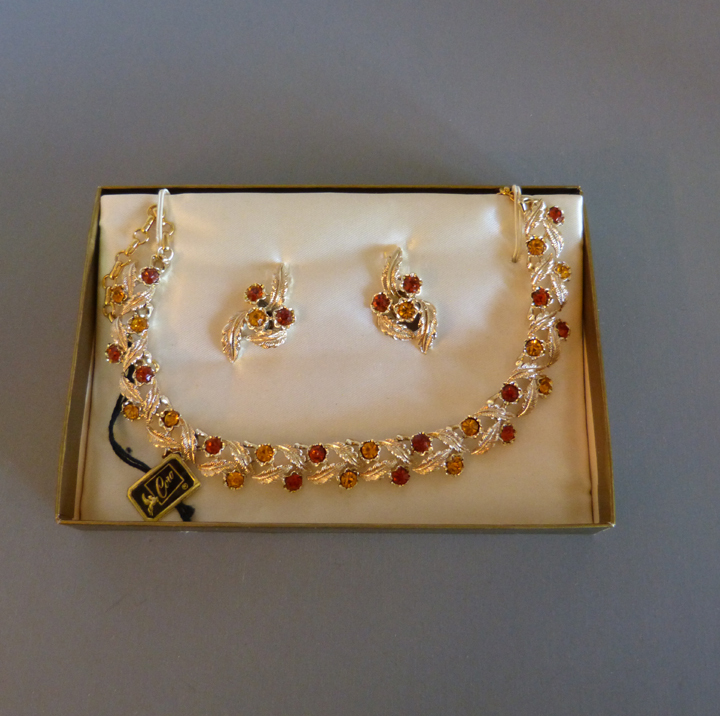 Vendome, best known for glittering glass beads and earrings, also featured other wonderful pieces such as the cabochon and rhinestone pieces pictured below. 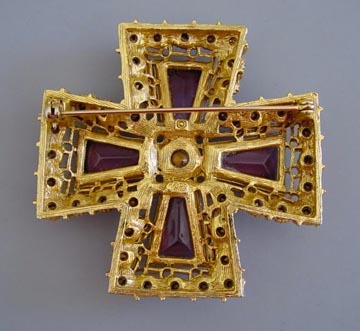 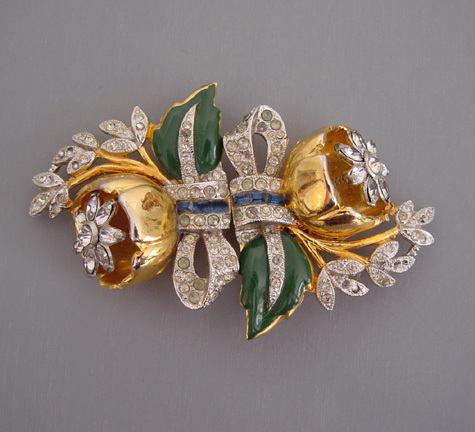 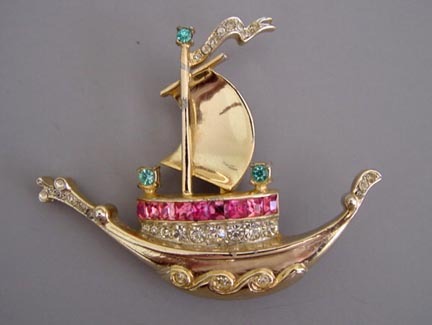 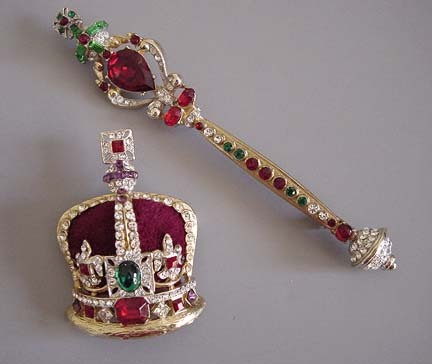 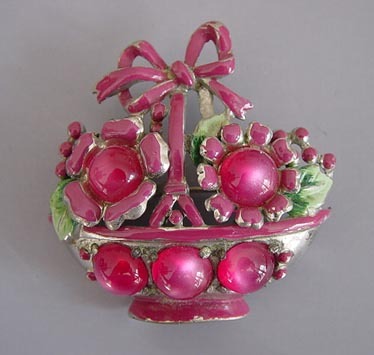 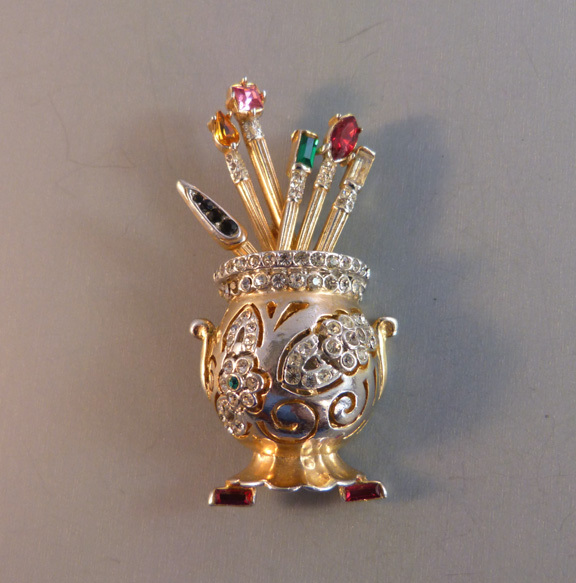 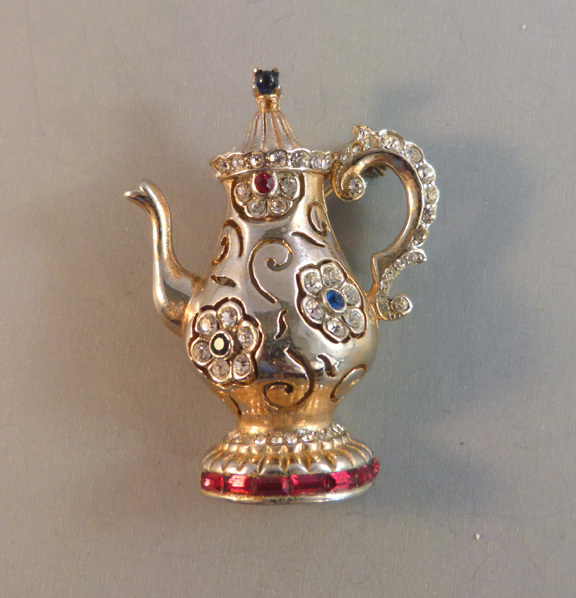 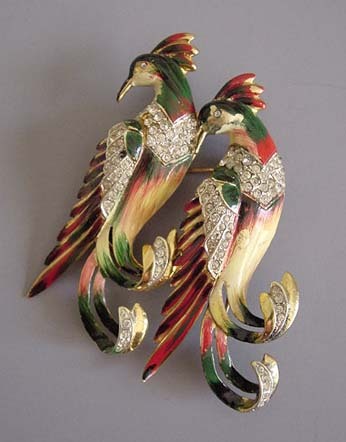 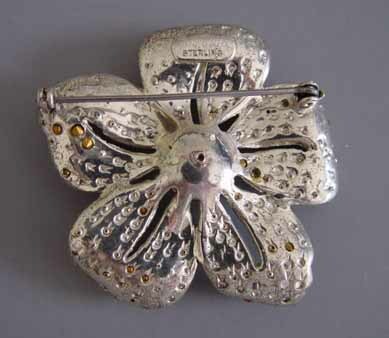 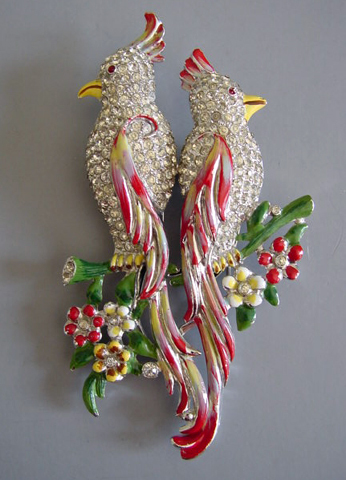 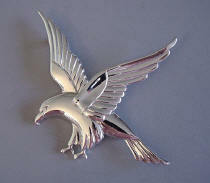 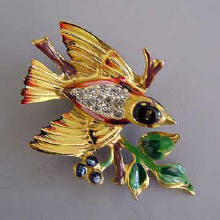 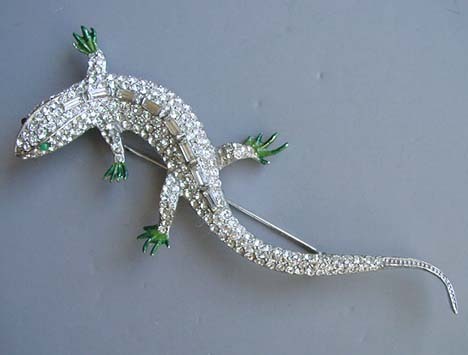 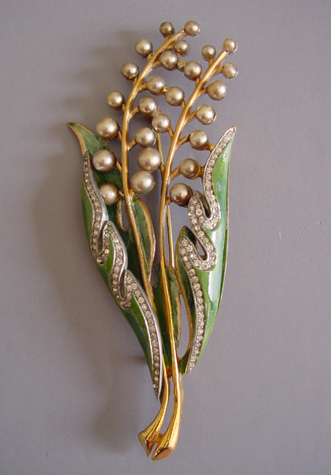 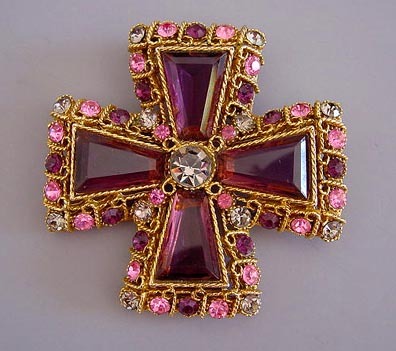 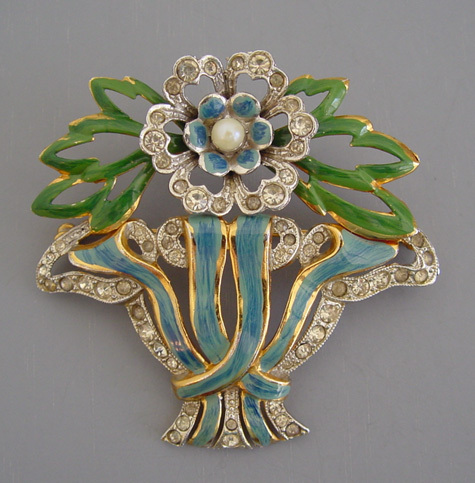 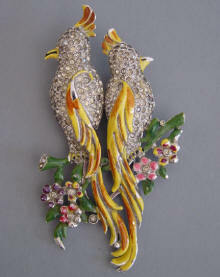 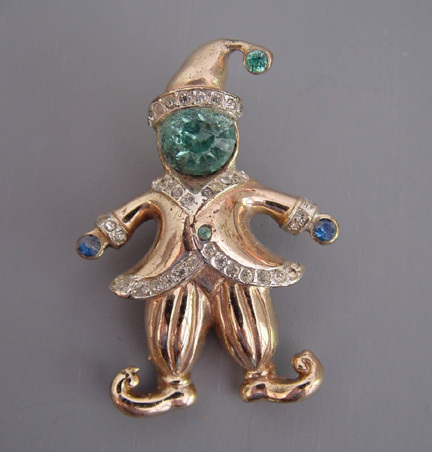 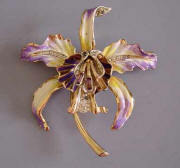 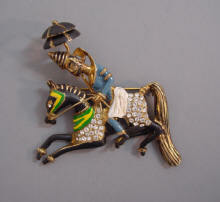 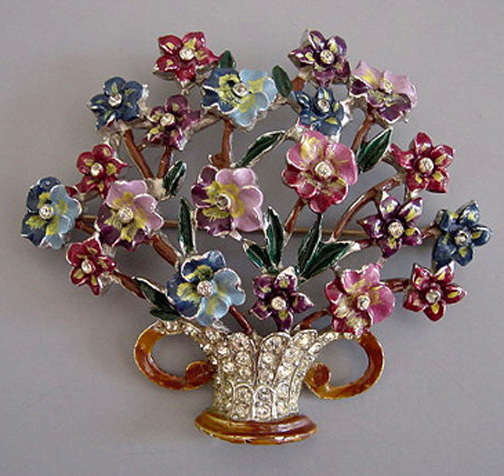 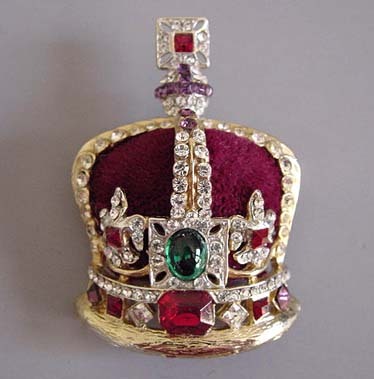 Corocraft was often sterling vermeil, and the pieces that incorporated both rhinestones and enameling are truly spectacular. 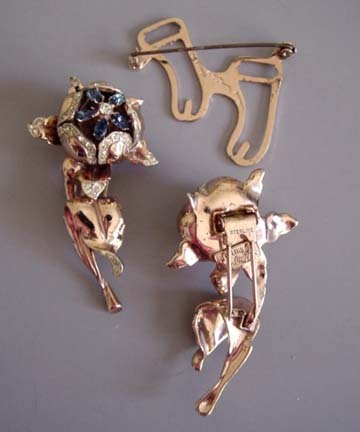 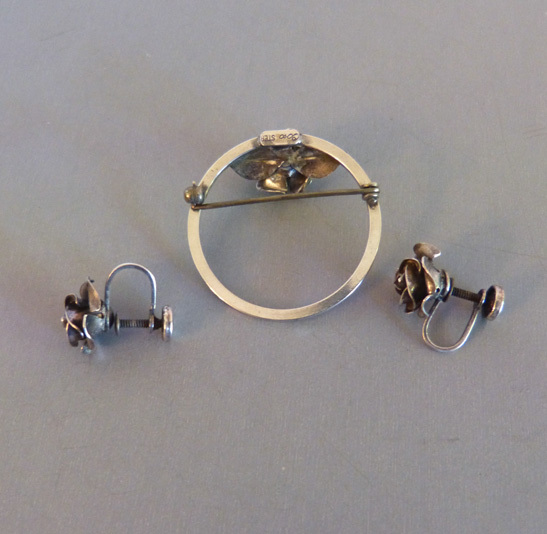 The "Day and Night" pieces shown below are true works of genius with fascinating mechanisms that allow the pieces to move. 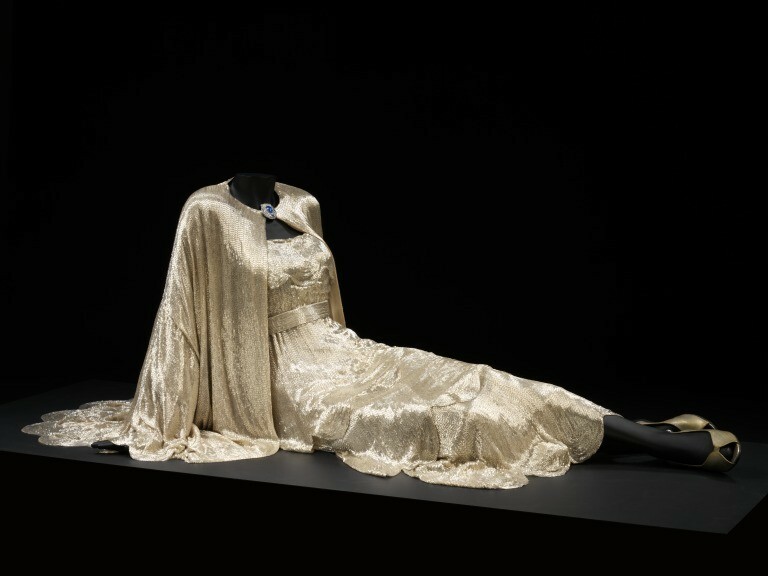 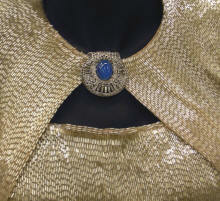 is "a once-in-a-lifetime opportunity to see over 100 of the most iconic costumes in the history of film-making. It explores the central role costume design plays in cinema storytelling. 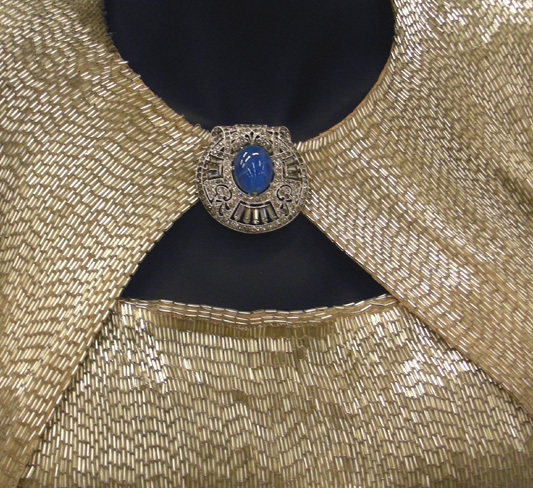 Bringing together over 100 of the most iconic movie costumes from across a century of film-making, it is a once-in-a-lifetime opportunity to see the clothes worn by unforgettable and beloved characters such as Dorothy Gale, Indiana Jones, Scarlett O'Hara, Jack Sparrow, Holly Golightly and Darth Vader." 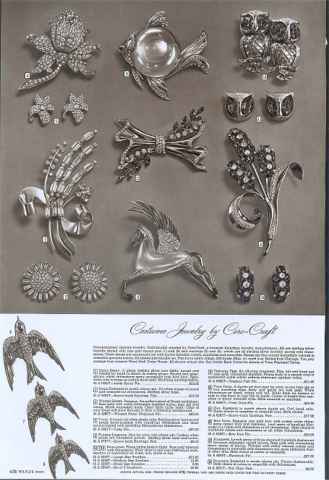 Thanks to Deborah Landis, my Coro Duette shown at the top above, was in this exhibit, traveling the world more than I ever hope to! 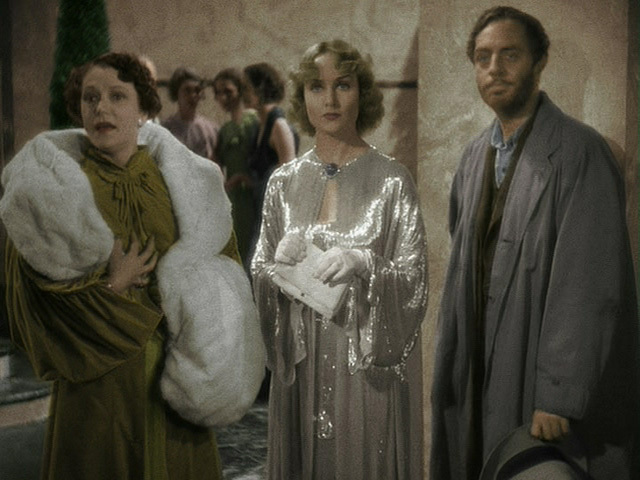 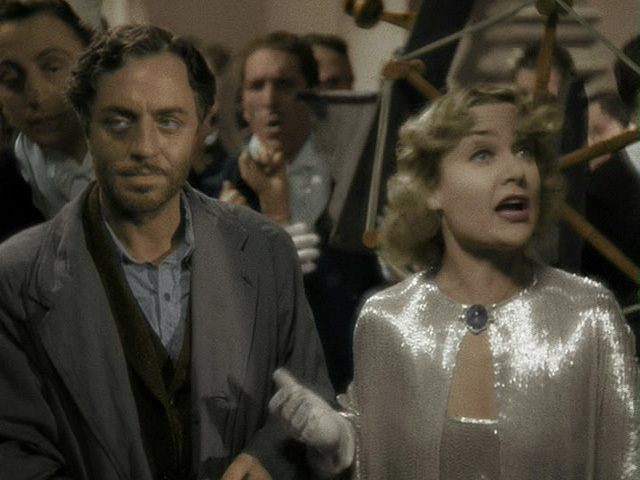 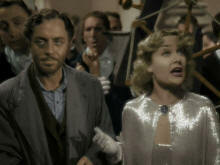 It is shown on the dress in this wonderful movie clip of the 1936 screwball comedy "My Man Godfrey" (William Powell) showing Carole Lombard wearing a blue star sapphire and diamond clip at her throat and a matching ring on her finger (not shown). 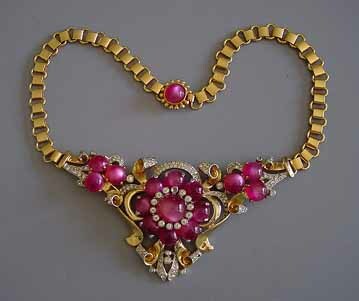 If you are a lover of 30's jewelry, become a fan of the Turner Movie Channel where so many of these 30's movies can be seen, commercial free. 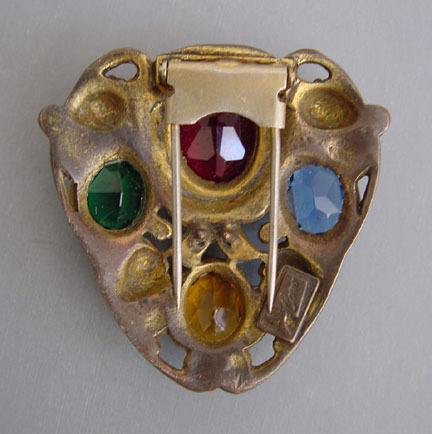 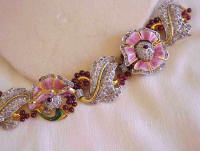 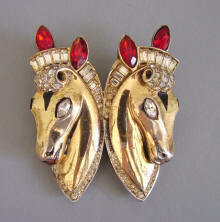 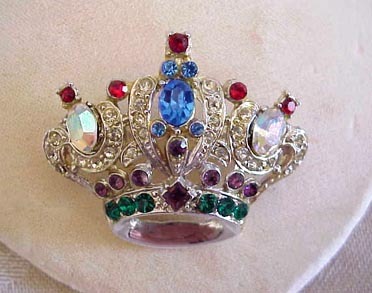 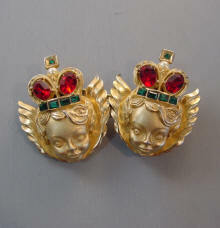 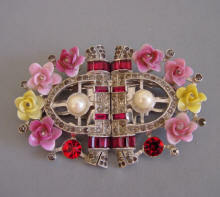 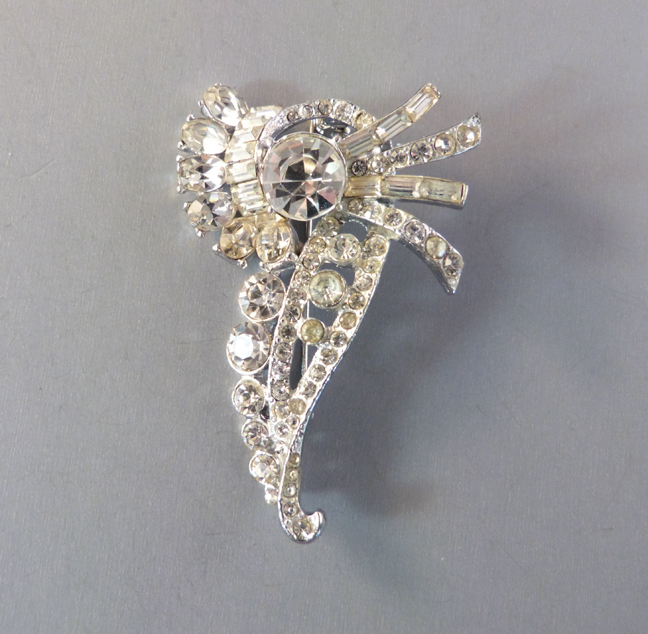 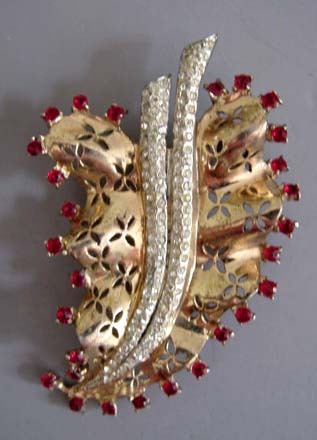 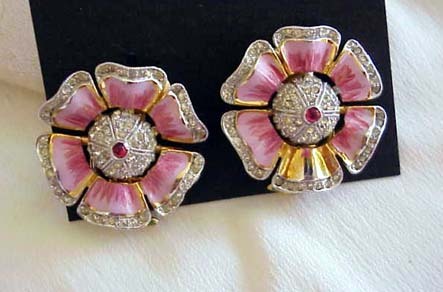 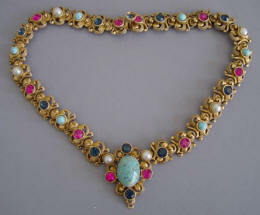 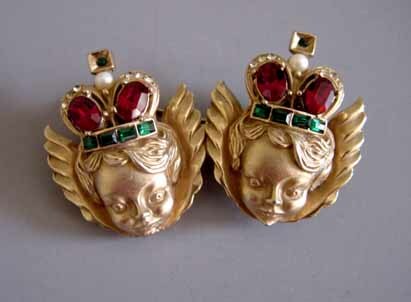 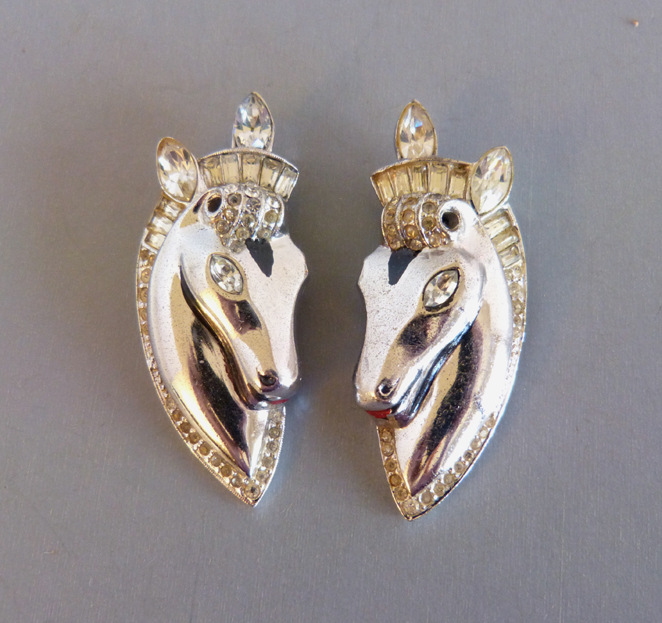 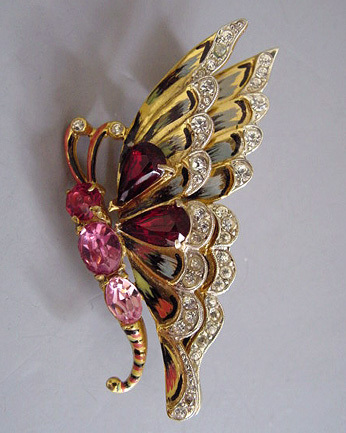 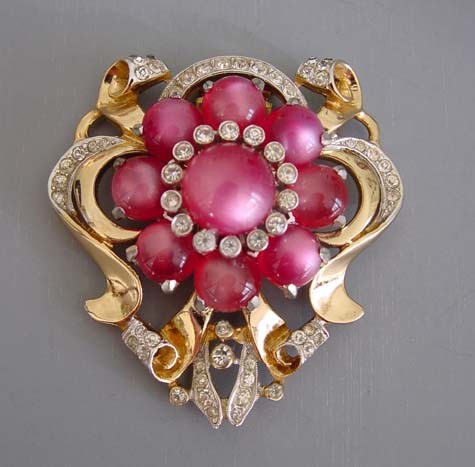 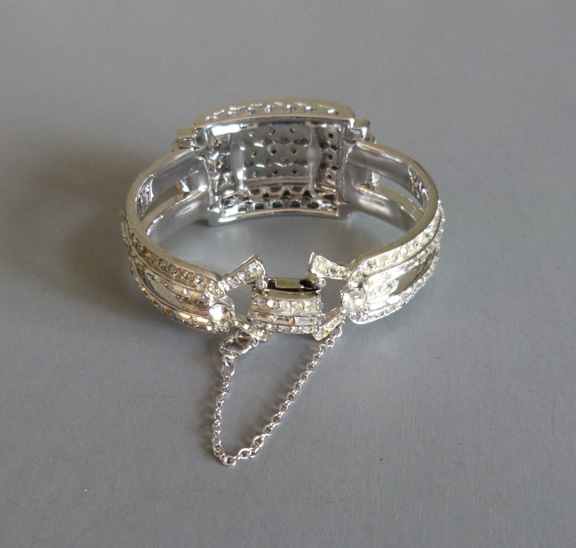 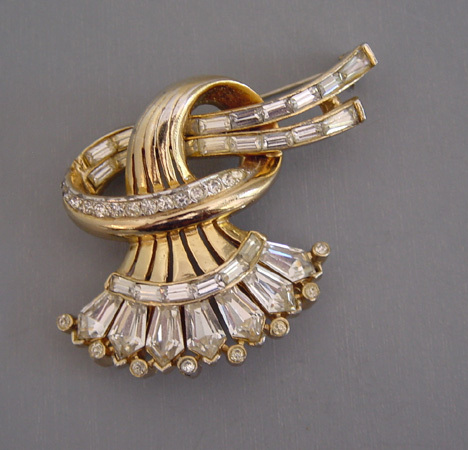 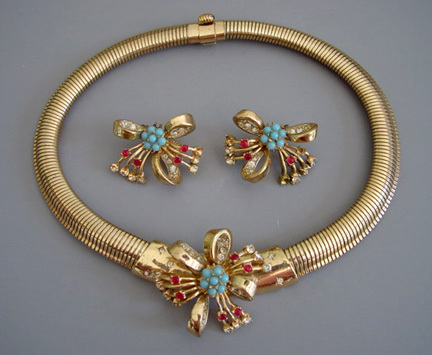 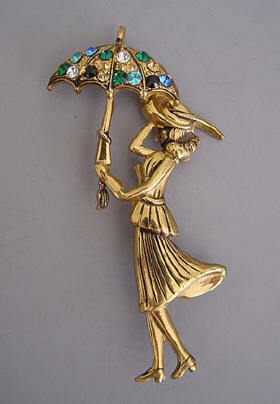 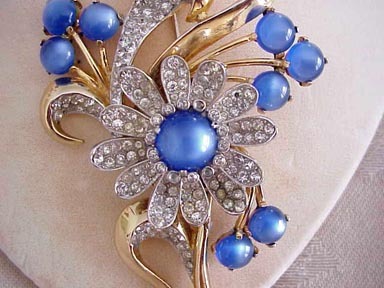 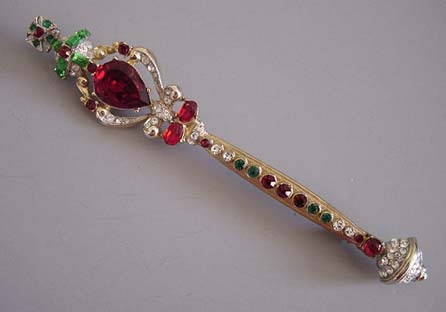 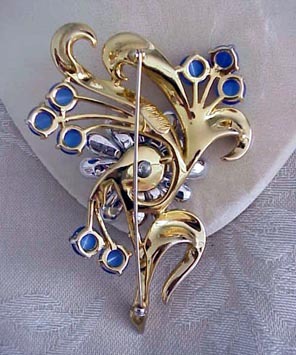 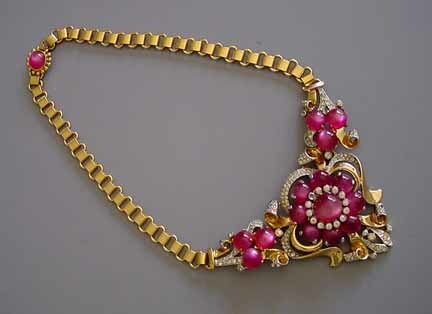 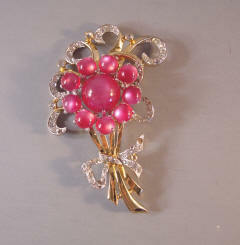 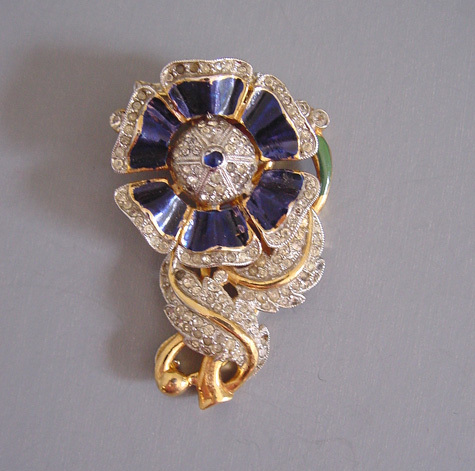 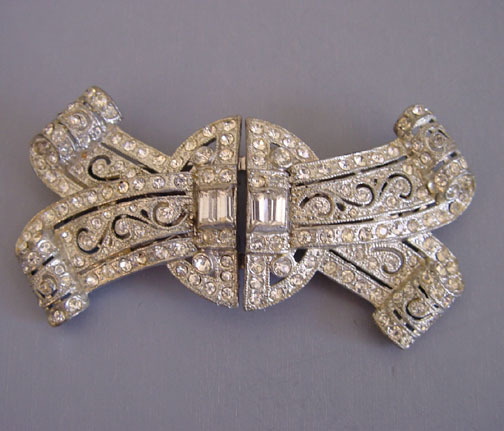 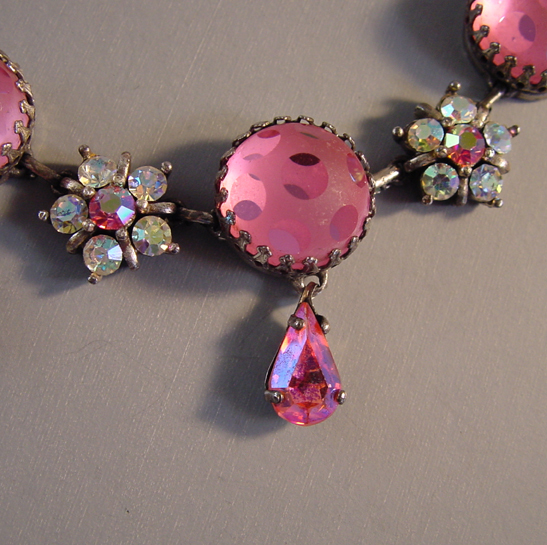 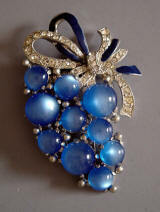 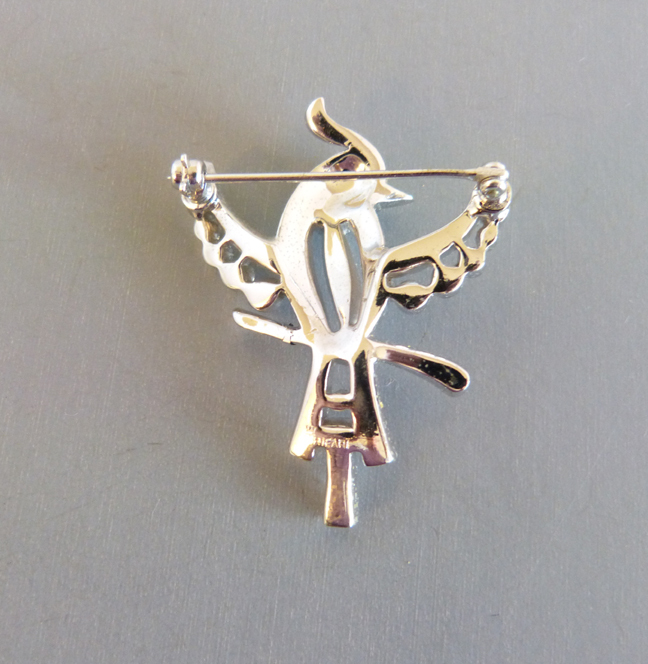 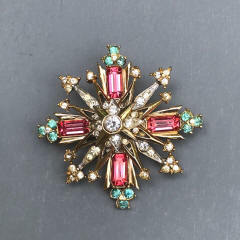 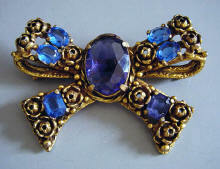 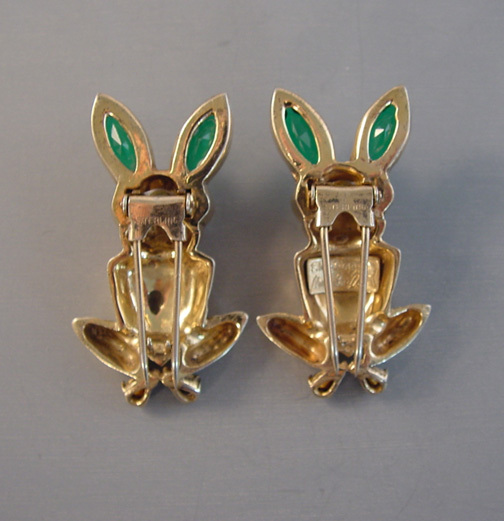 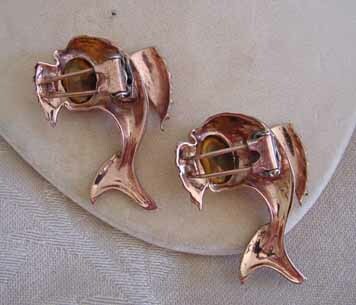 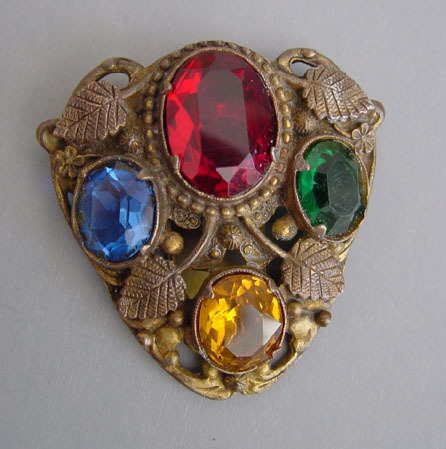 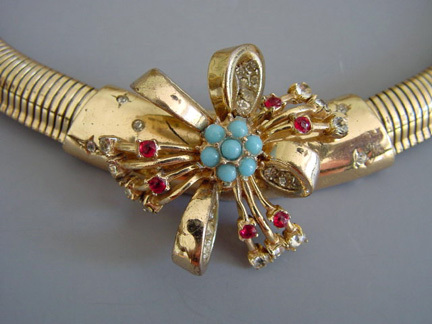 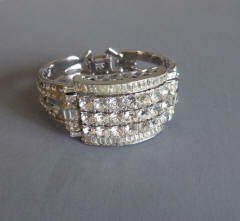 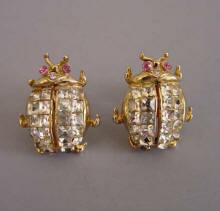 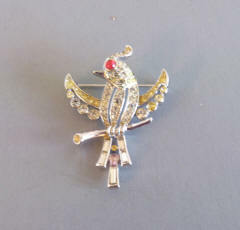 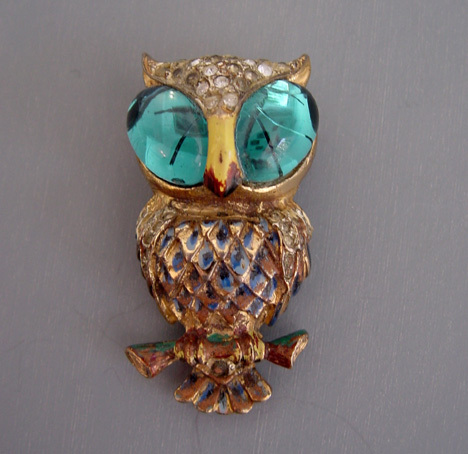 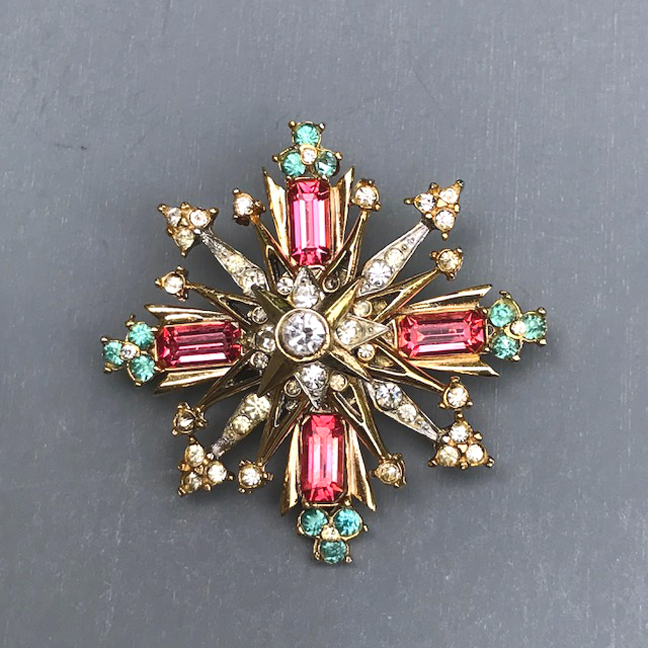 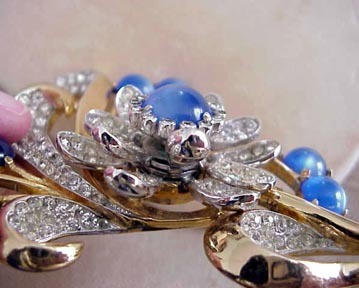 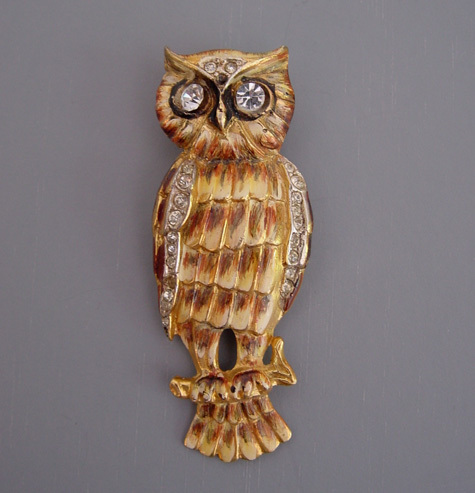 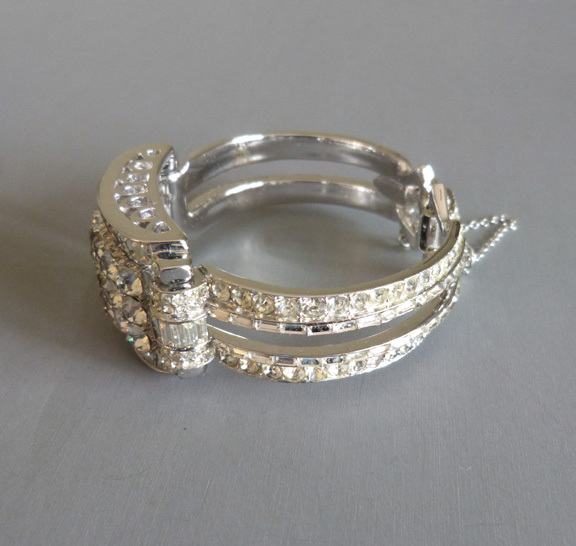 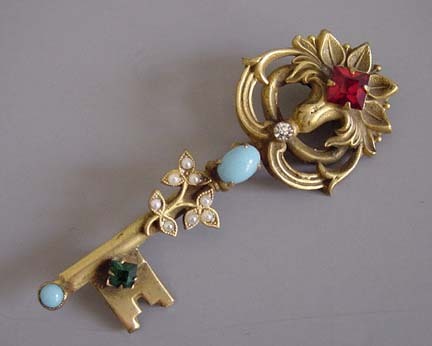 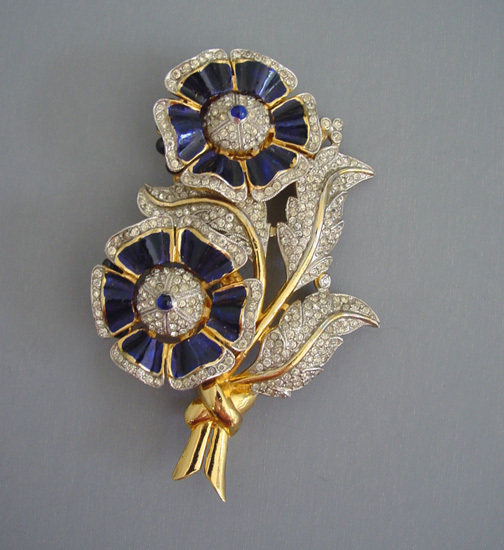 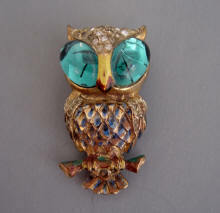 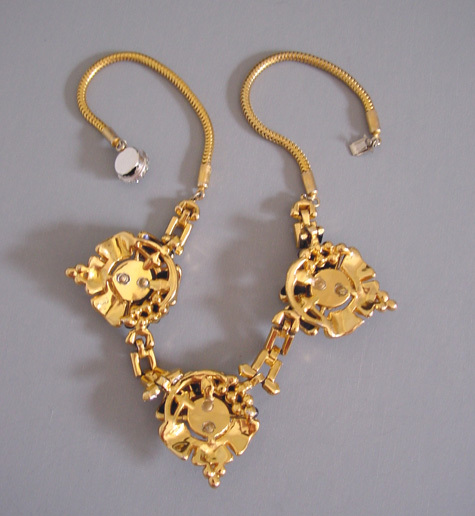 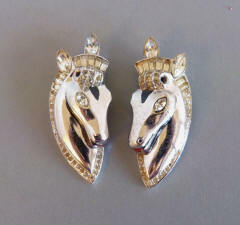 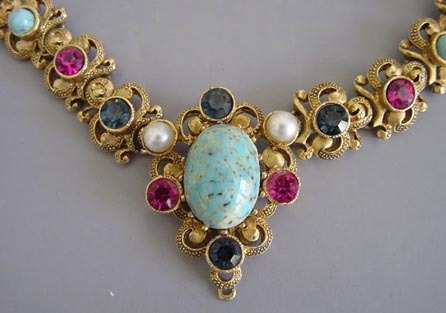 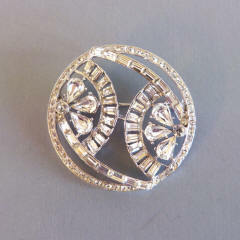 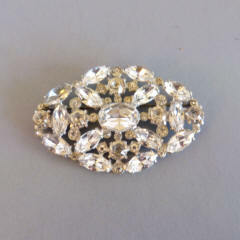 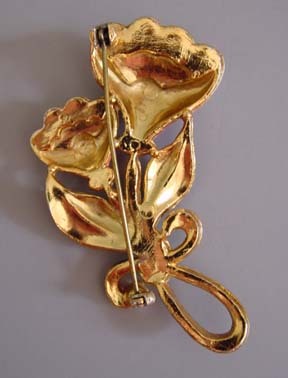 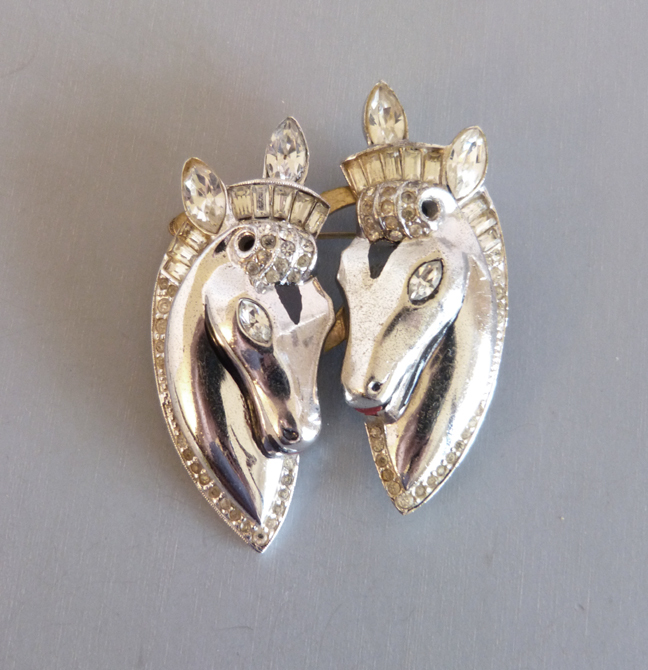 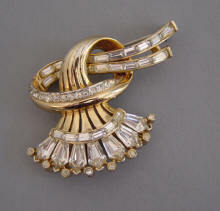 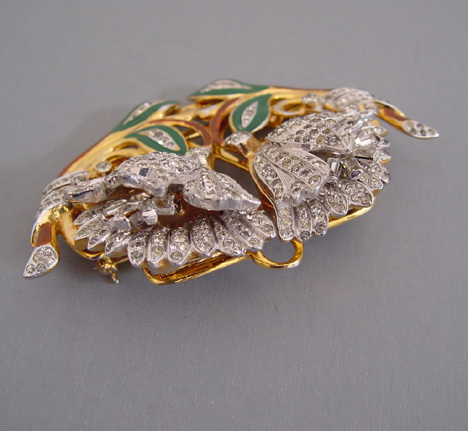 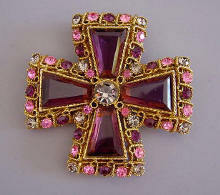 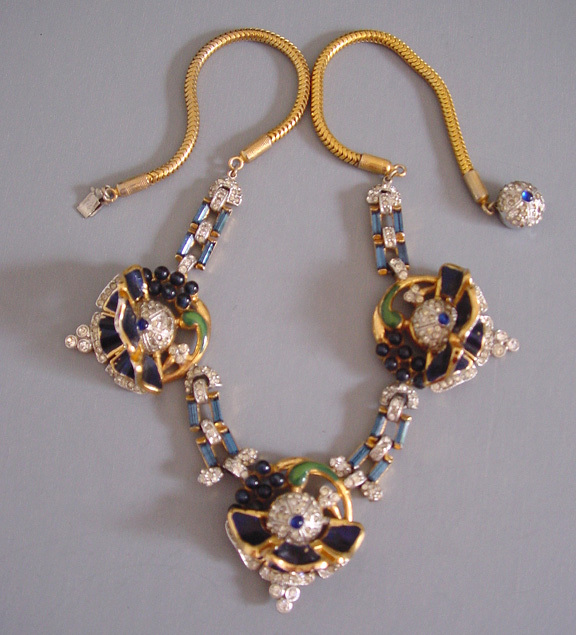 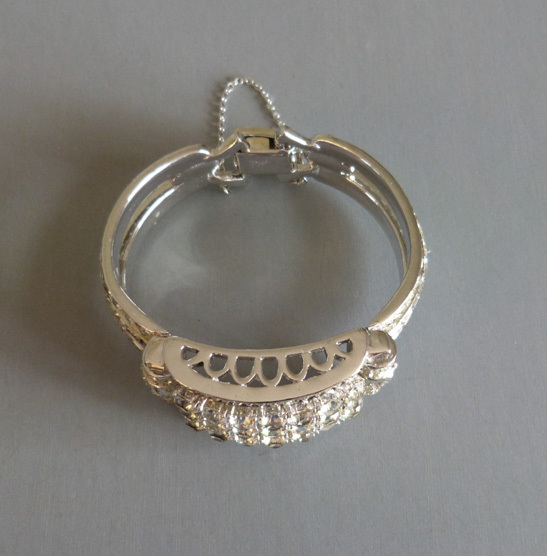 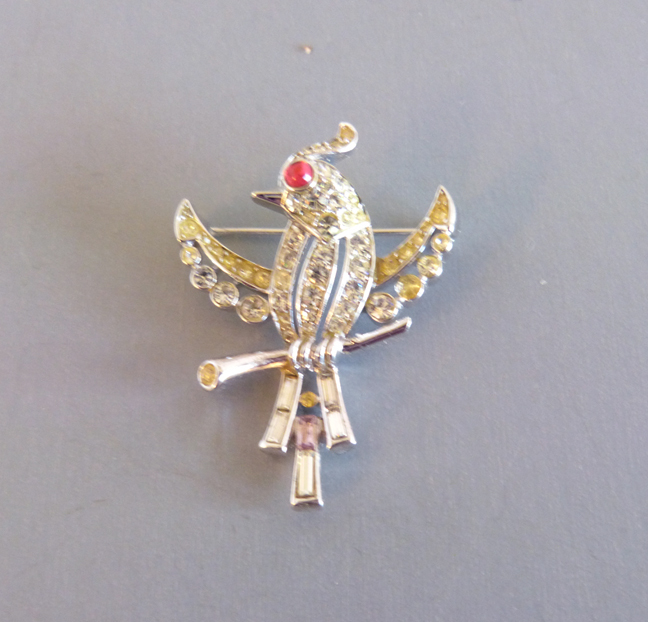 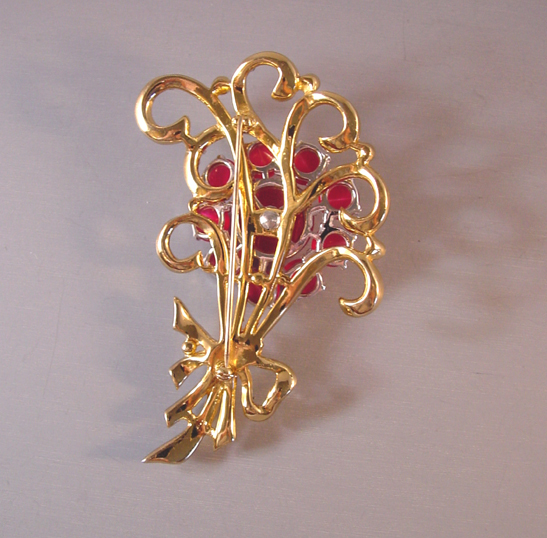 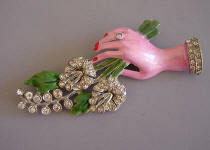 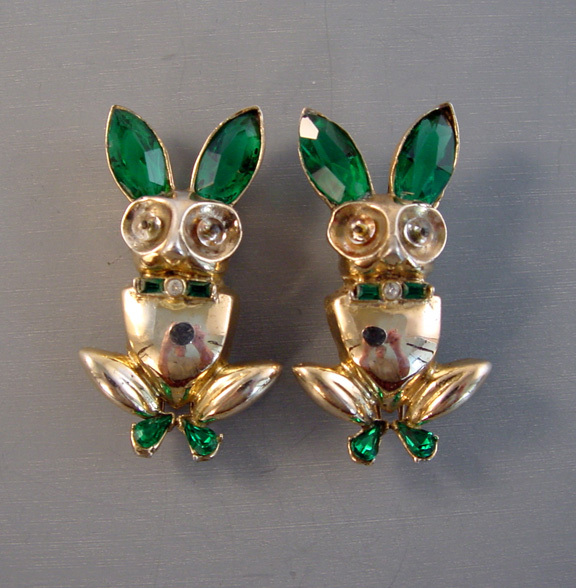 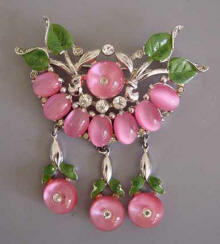 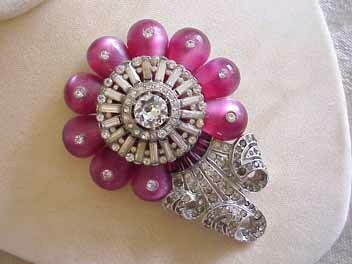 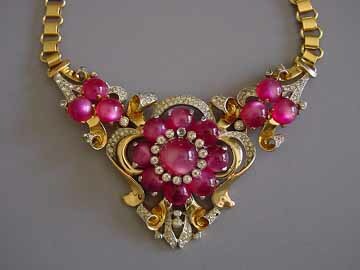 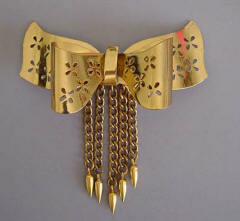 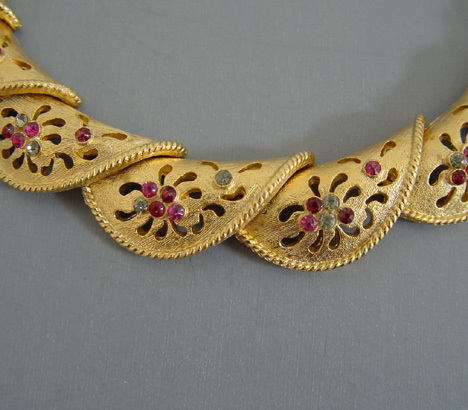 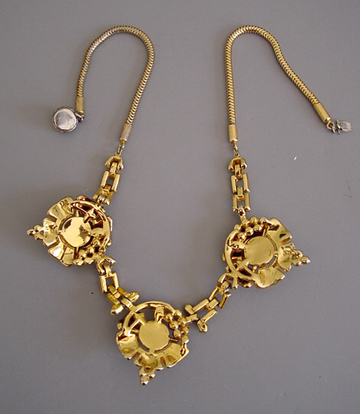 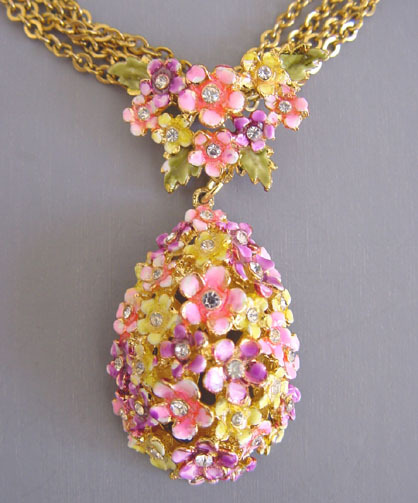 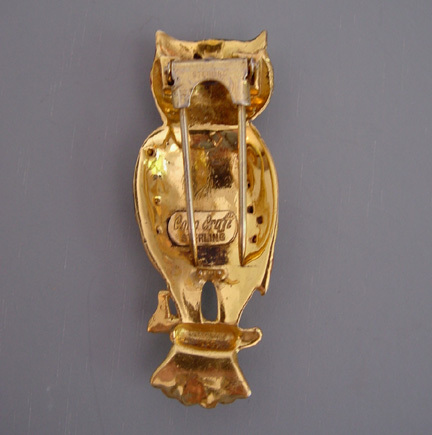 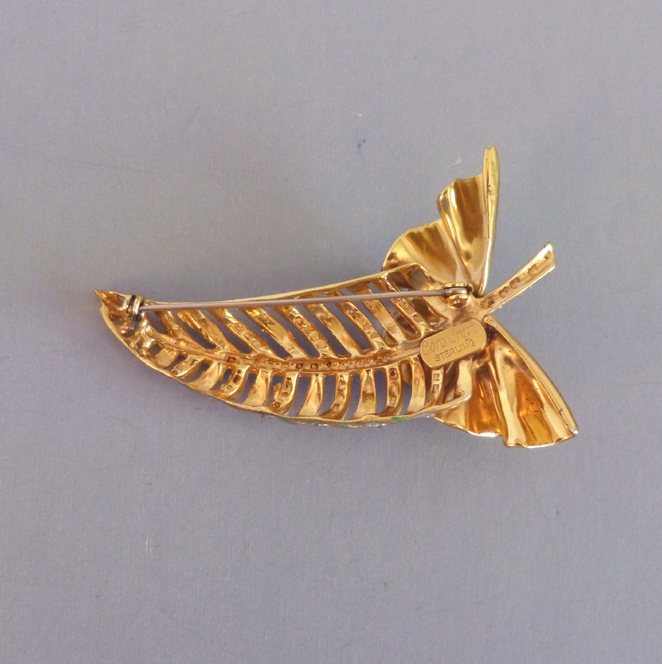 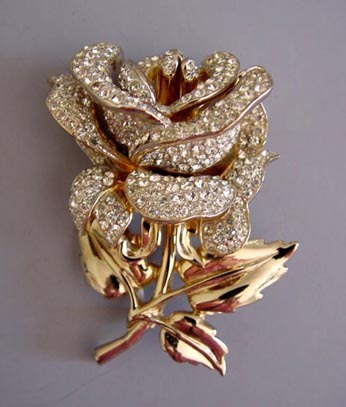 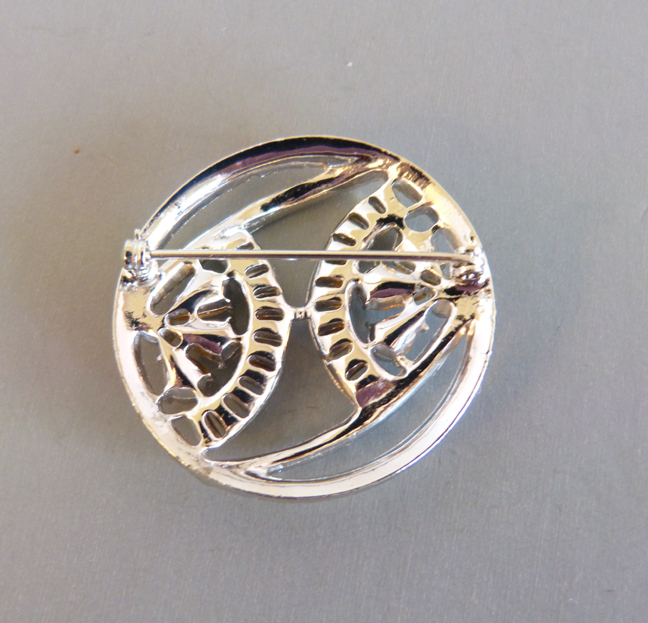 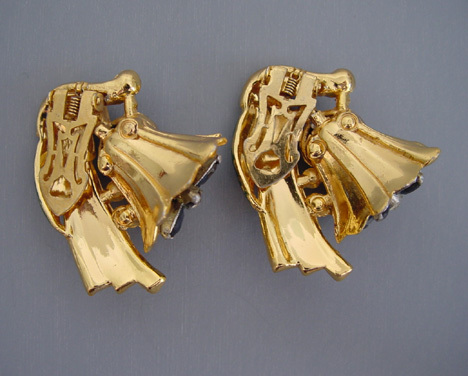 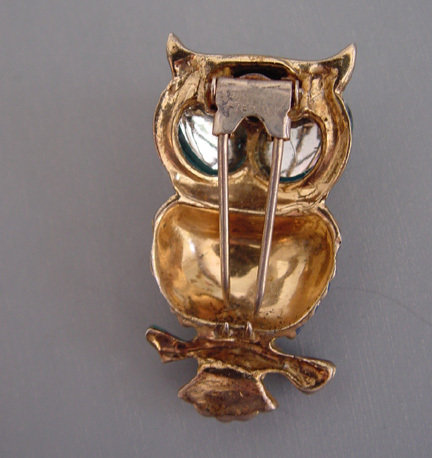 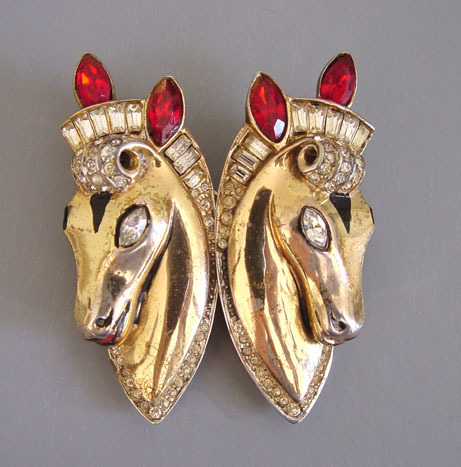 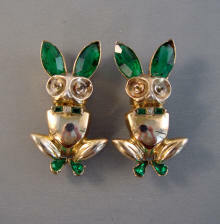 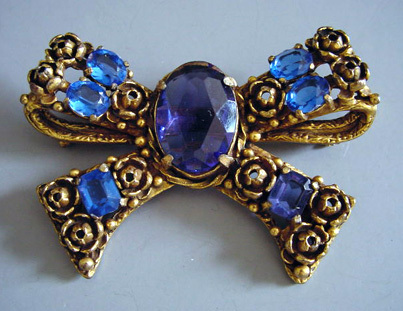 It is a real treat for both vintage jewelry and classic movie lovers like me! 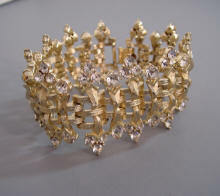 CORO Deco style 1953 brilliant clear rhinestones bracelet with clear rhinestones set in silver tone, back clasp with a safety chain, 7" and 1-1/8" at the front and 3/4" at the back. 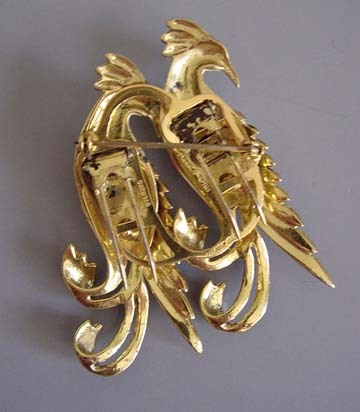 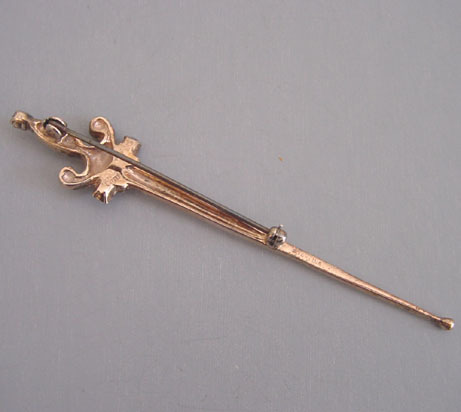 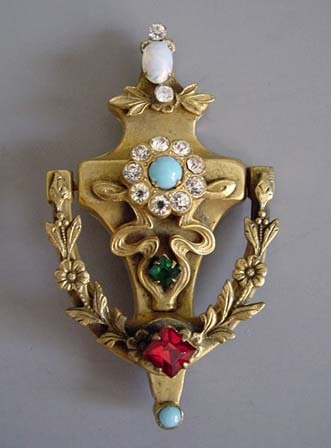 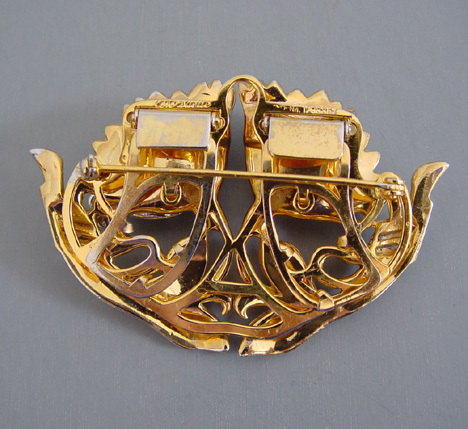 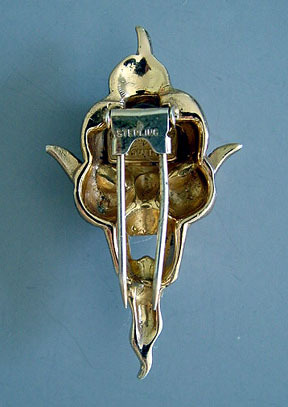 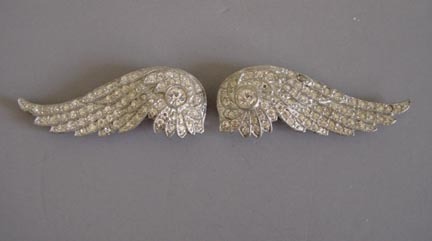 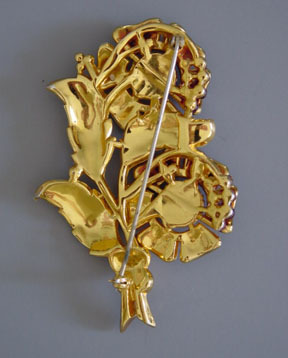 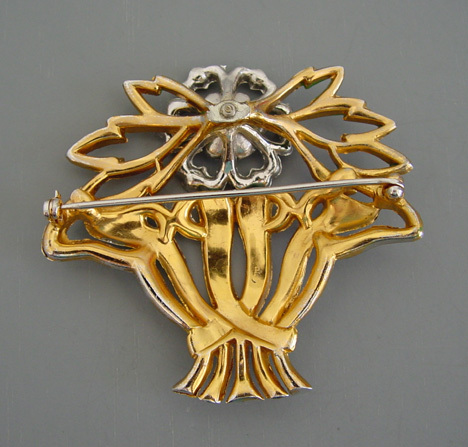 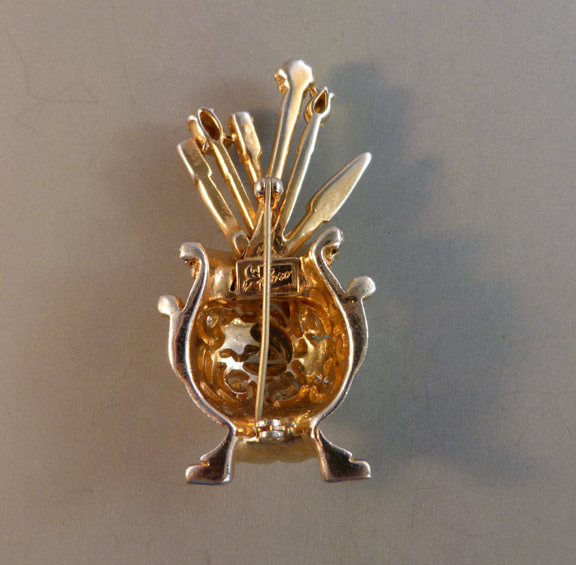 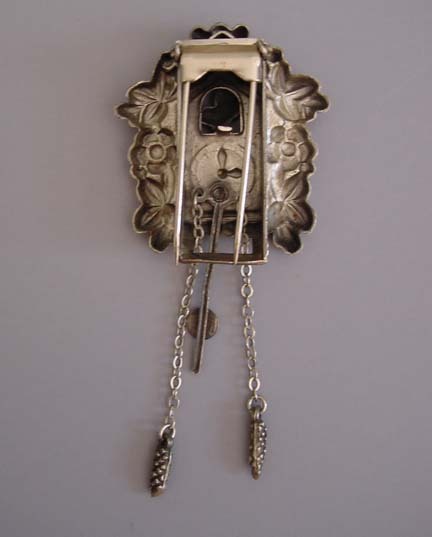 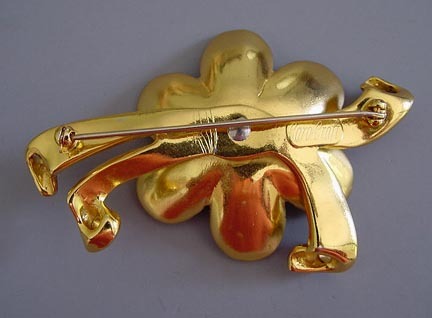 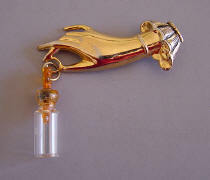 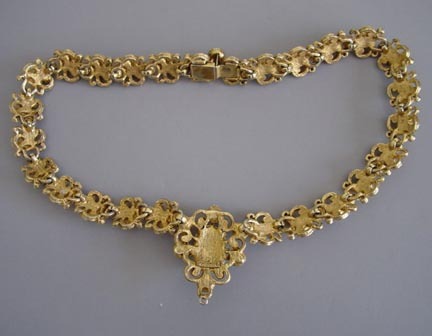 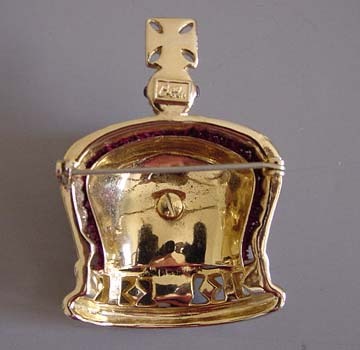 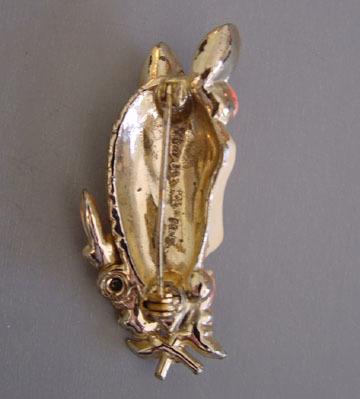 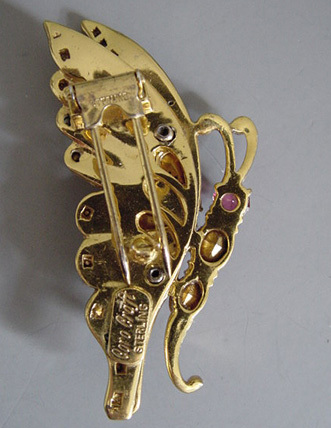 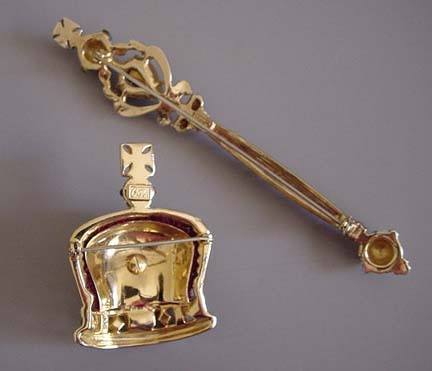 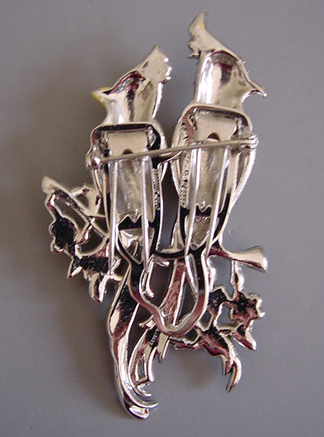 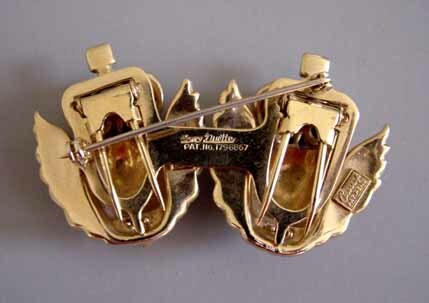 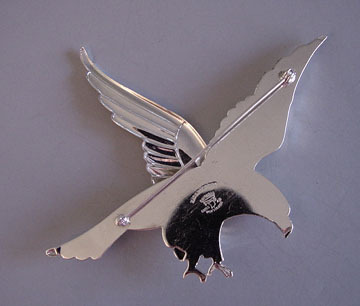 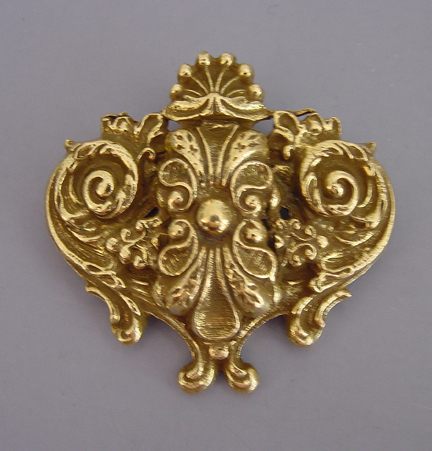 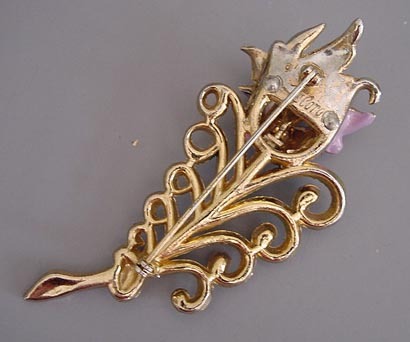 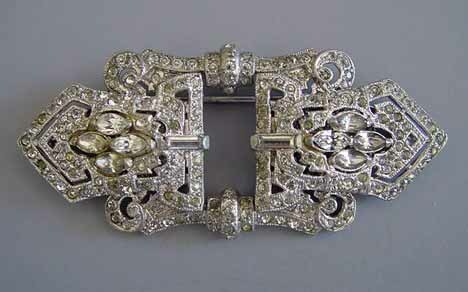 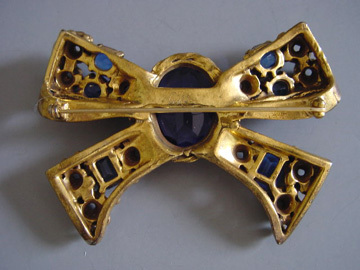 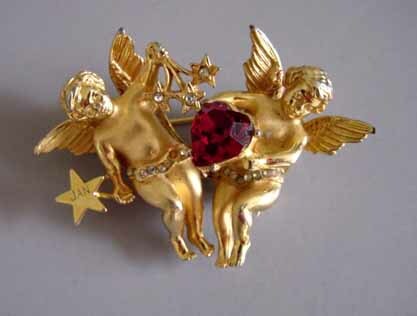 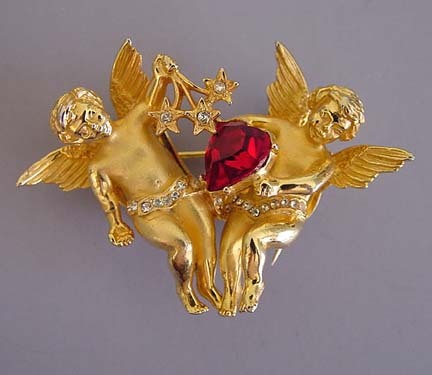 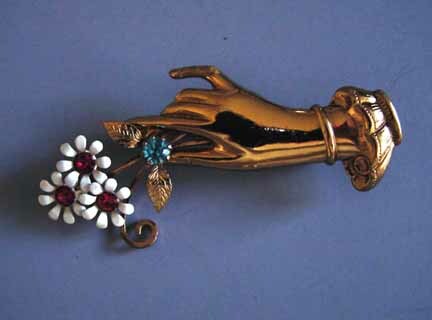 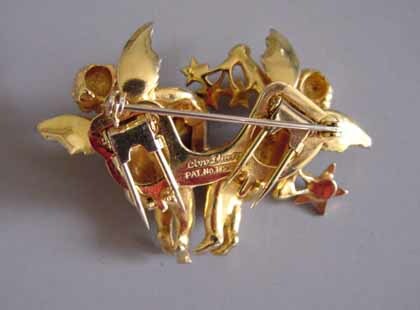 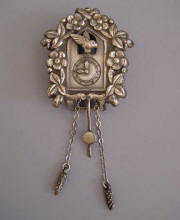 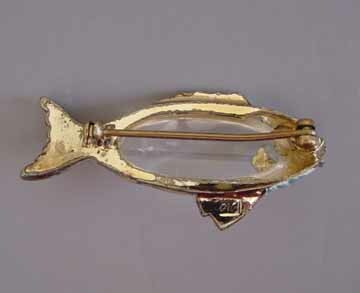 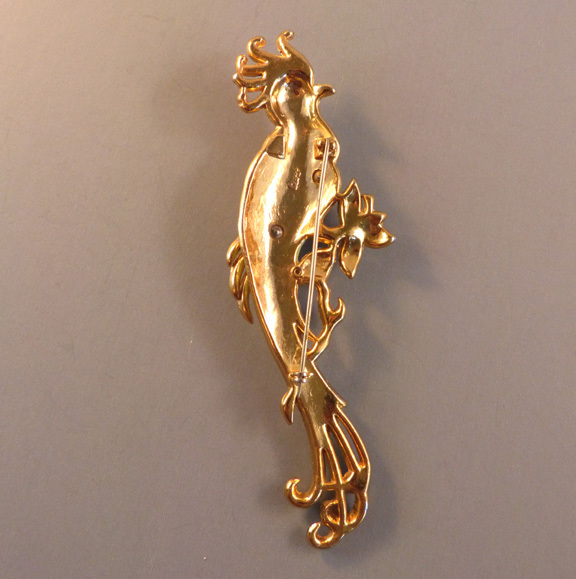 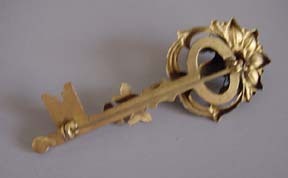 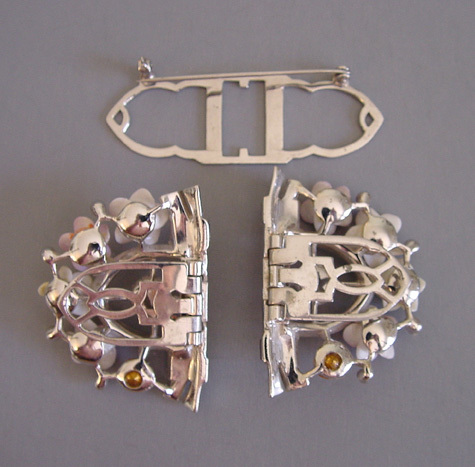 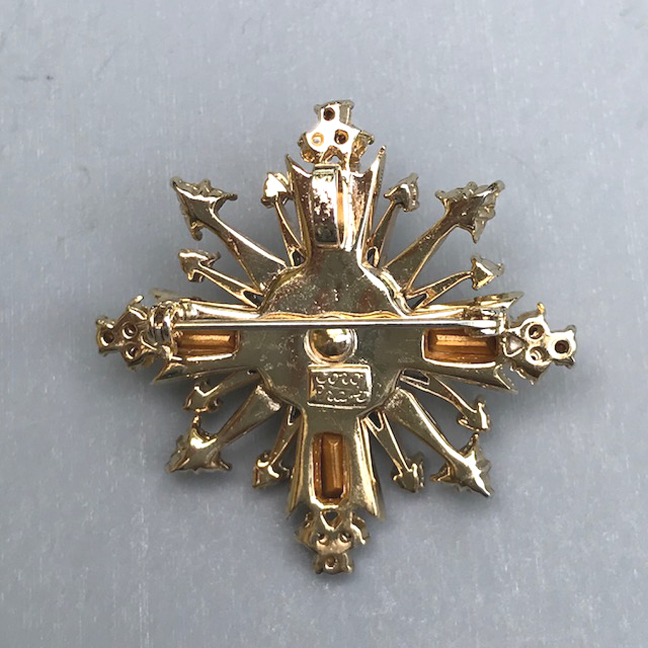 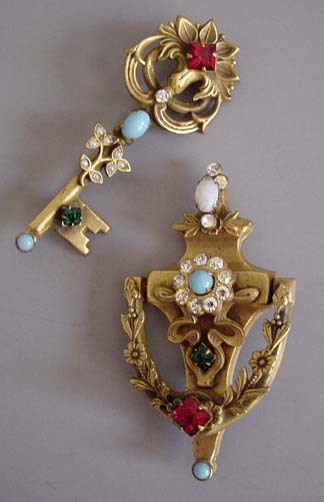 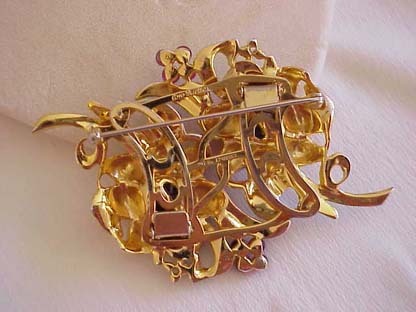 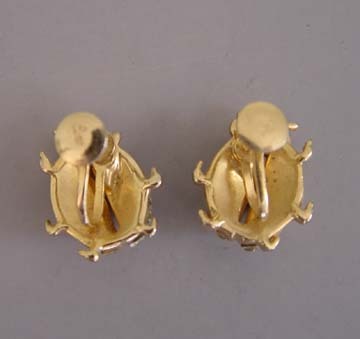 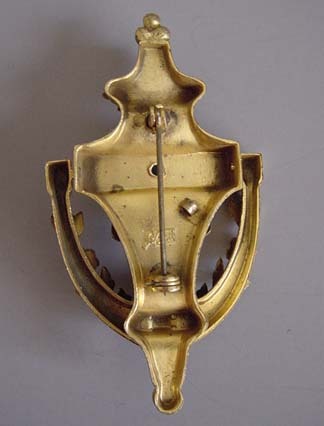 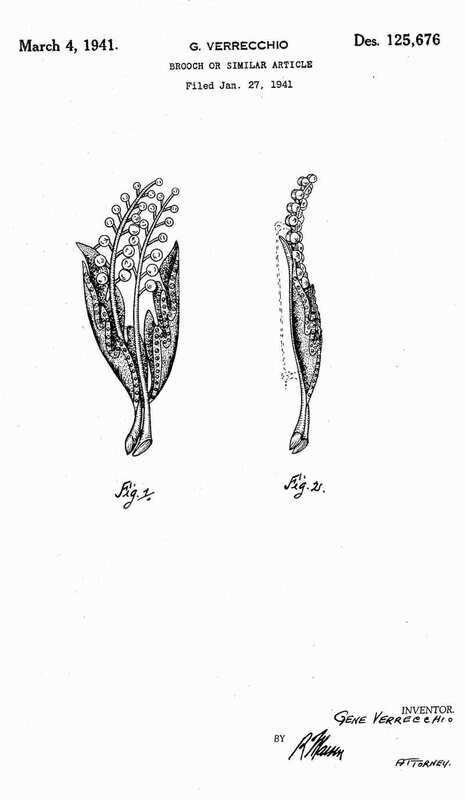 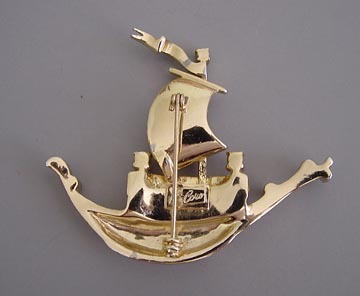 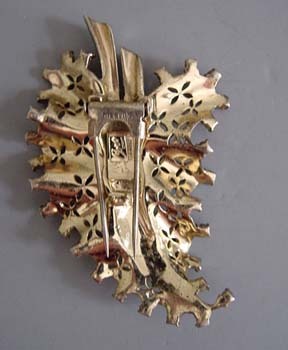 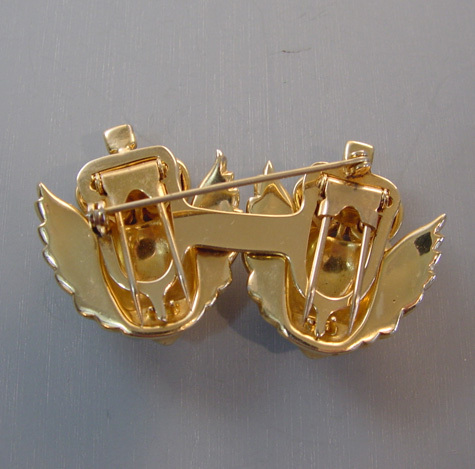 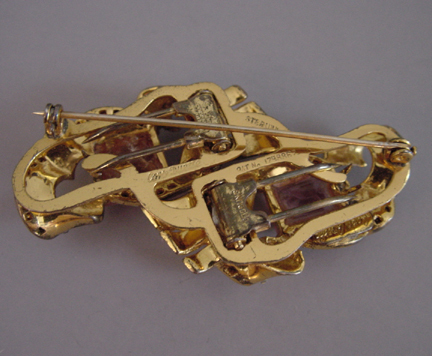 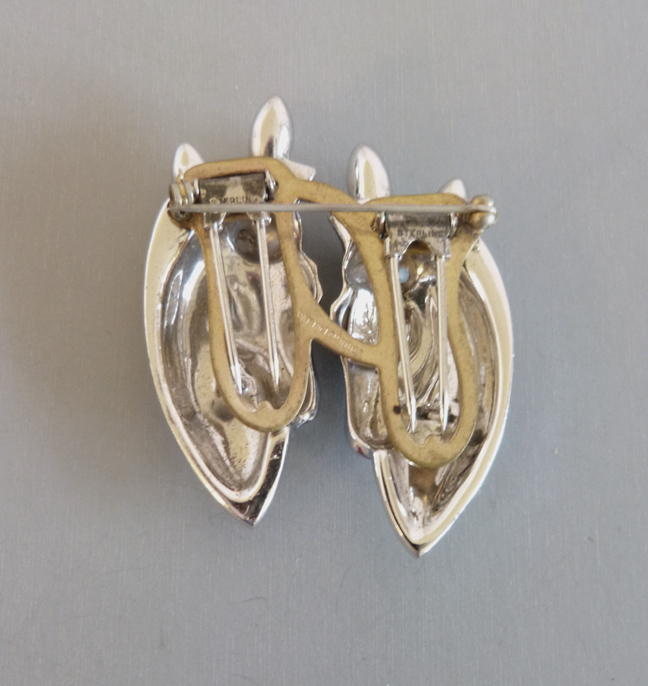 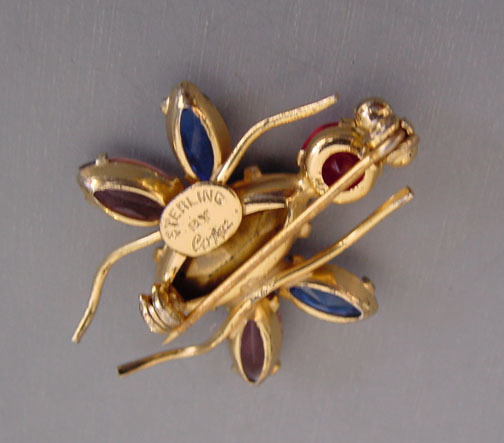 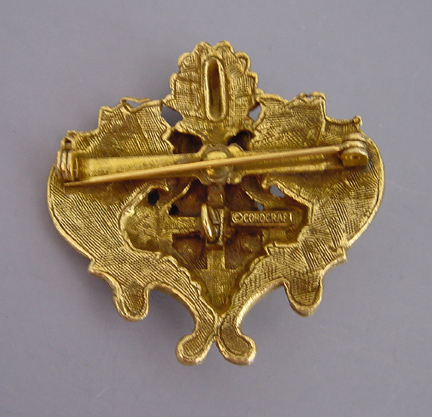 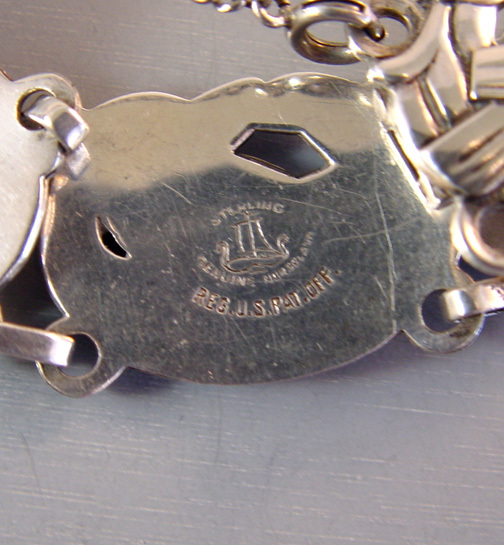 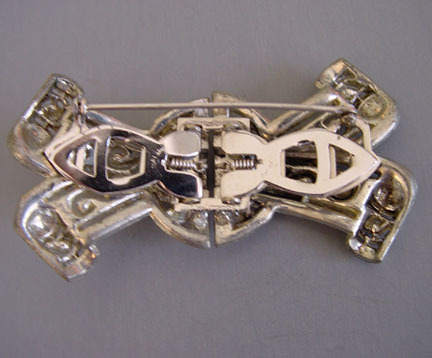 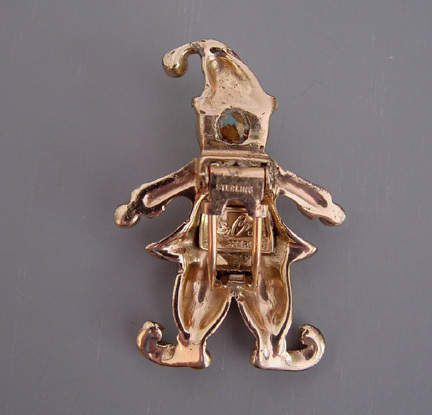 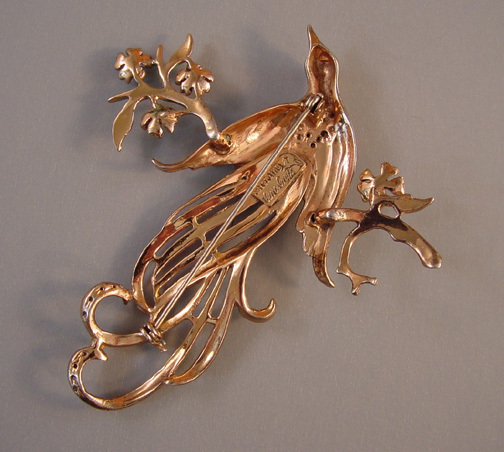 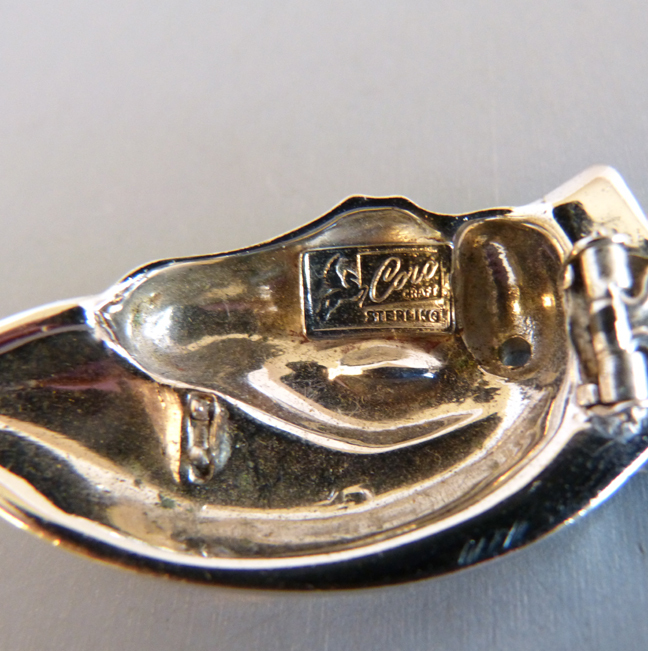 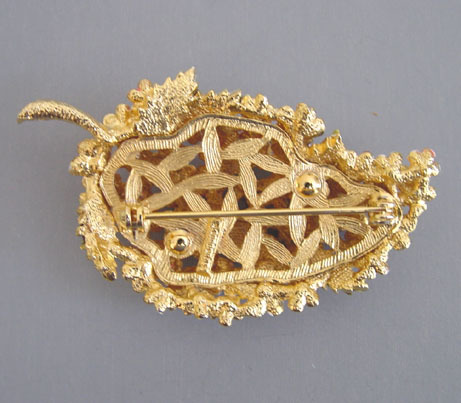 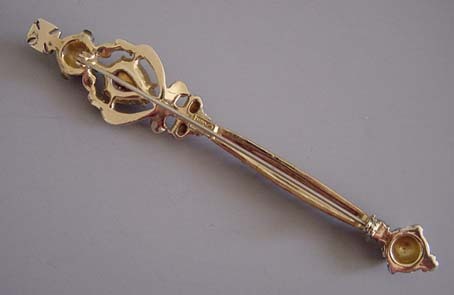 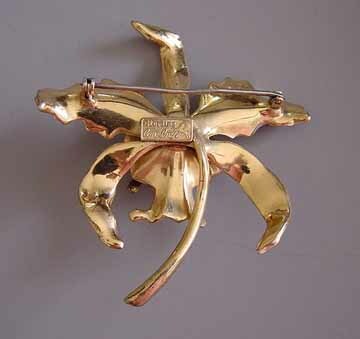 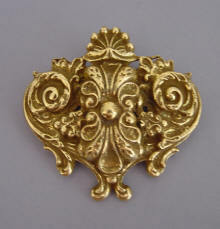 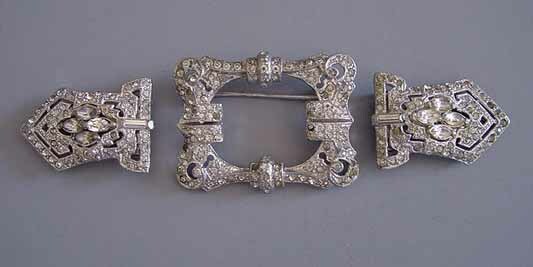 The mark, "Coro des pat pend" is on the back of the clasp. 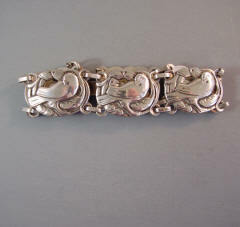 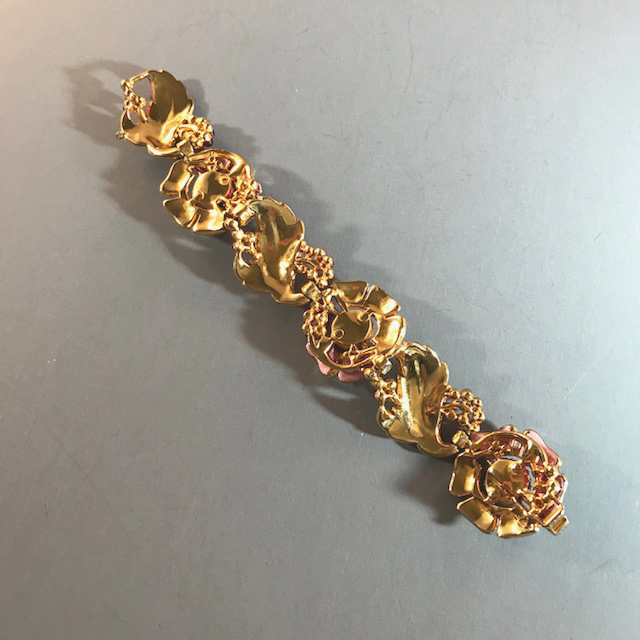 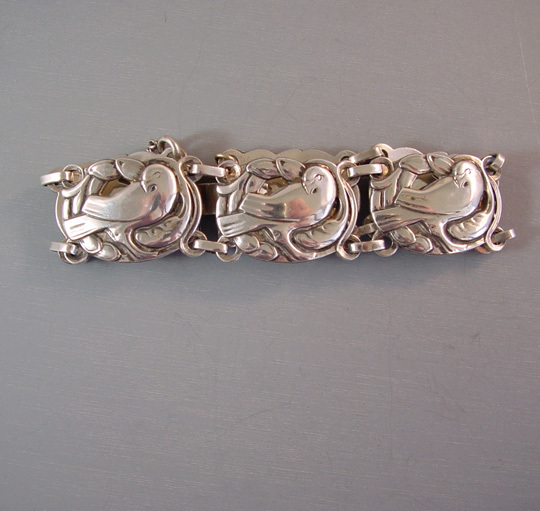 This amazing bracelet has pierced sides and is decorated with baguettes and chatons, which are all brilliant but one, which is very slightly grayed. 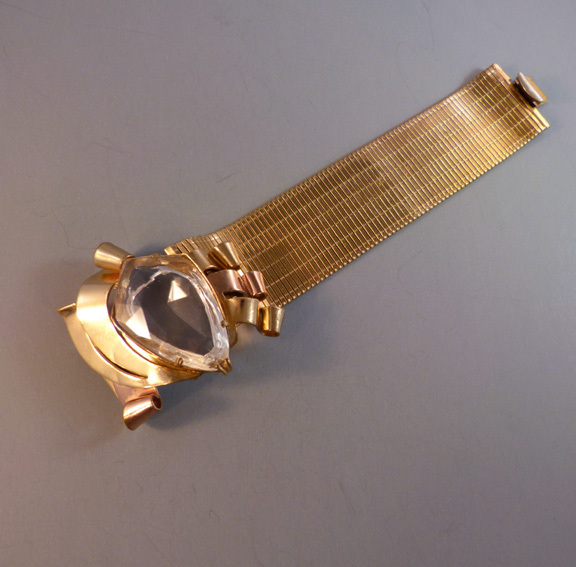 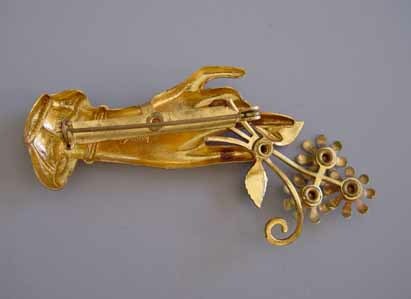 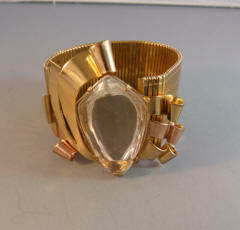 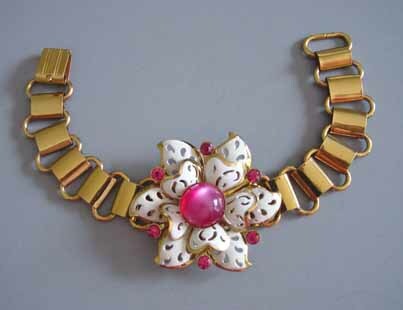 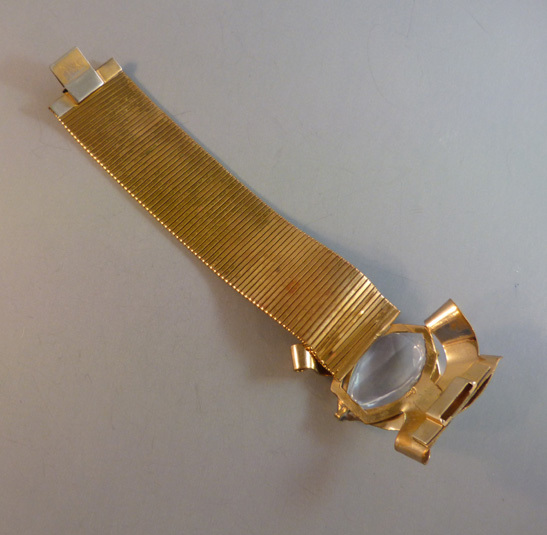 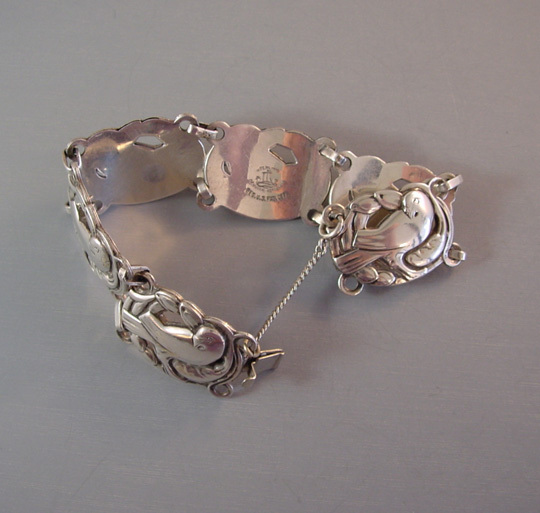 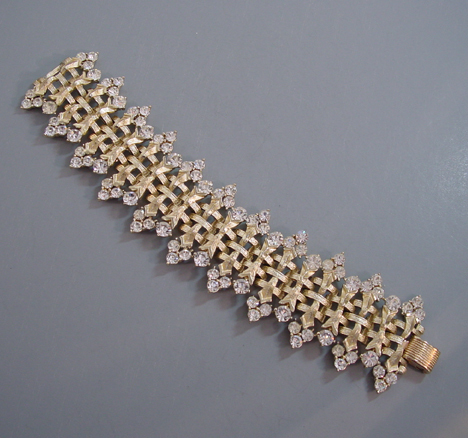 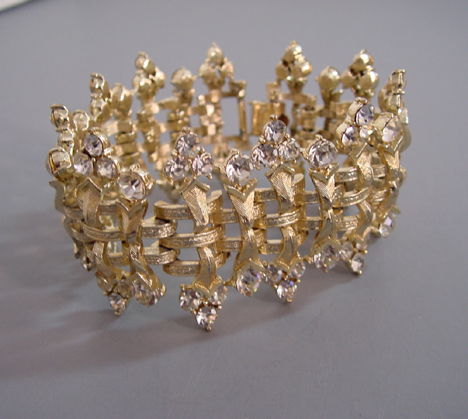 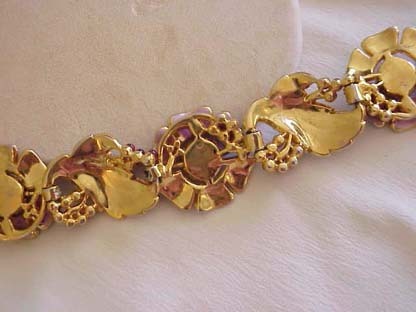 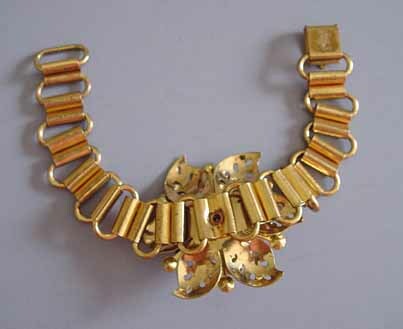 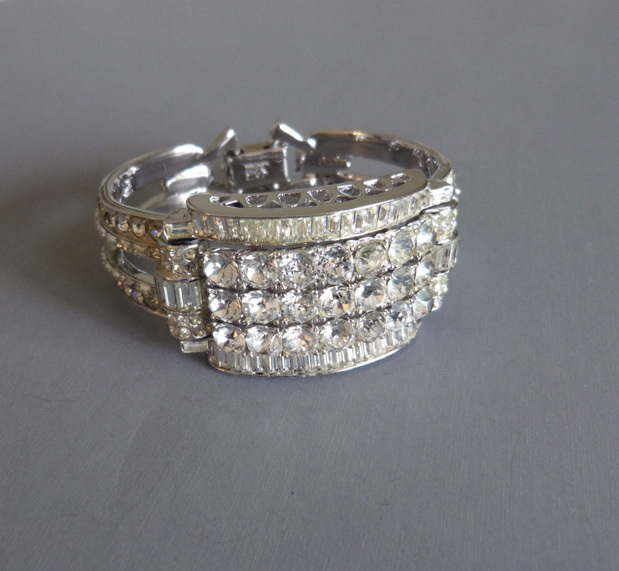 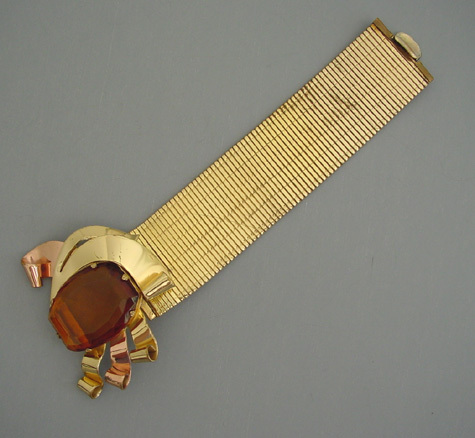 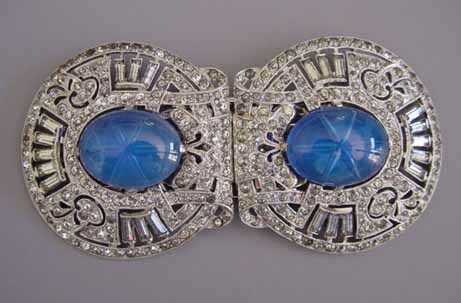 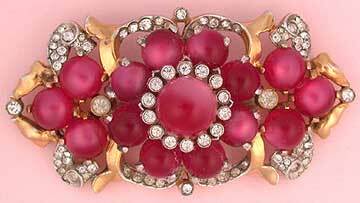 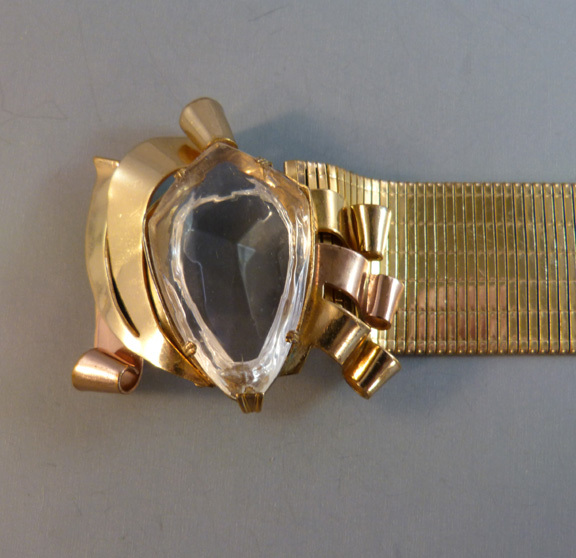 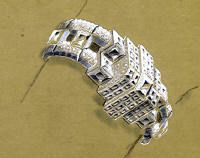 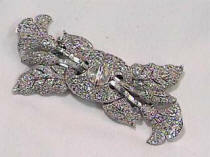 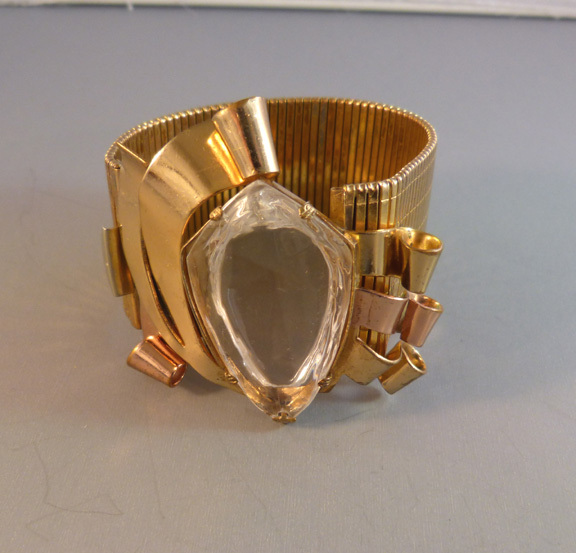 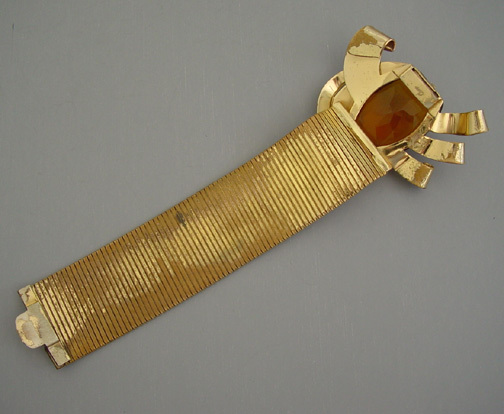 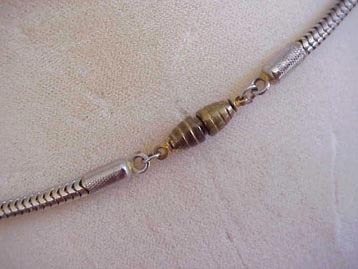 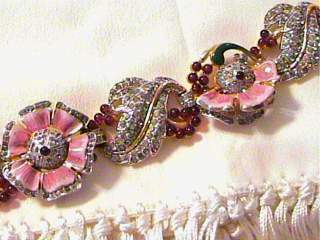 The patent number for this amazing bracelet is 170,124 dating it to 1953, and it was patented by Adolph Katz. 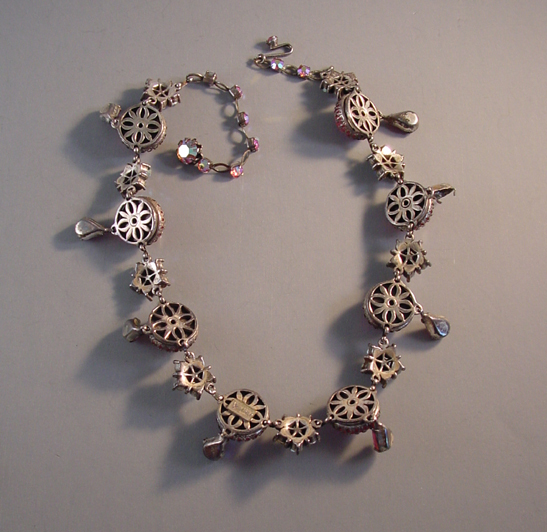 View View View #C38522 The Coro bracelet shown at the left reminds me of a DeRosa design art work seen HERE, not exact of course, but similar. 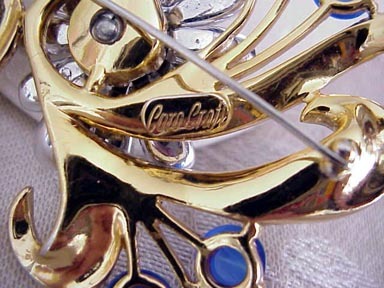 COROCRAFT "Jelly Bellies", birds and owls.